How the race works: The schooners are split into classes using a complicated formula, but to keep it simple, let’s just call it speed & length. 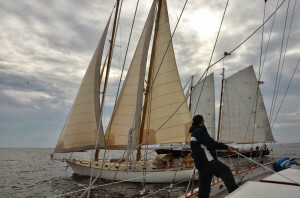 Class AA (the big traditional schooners) and Class A (our class, which are smaller, lighter, and not as traditionally rigged) start at the same time on the starting line. The finish line is 120 nautical miles down the bay at Thimble Shoal Light’s latitude line to the Chesapeake Bay Bridge Tunnel. 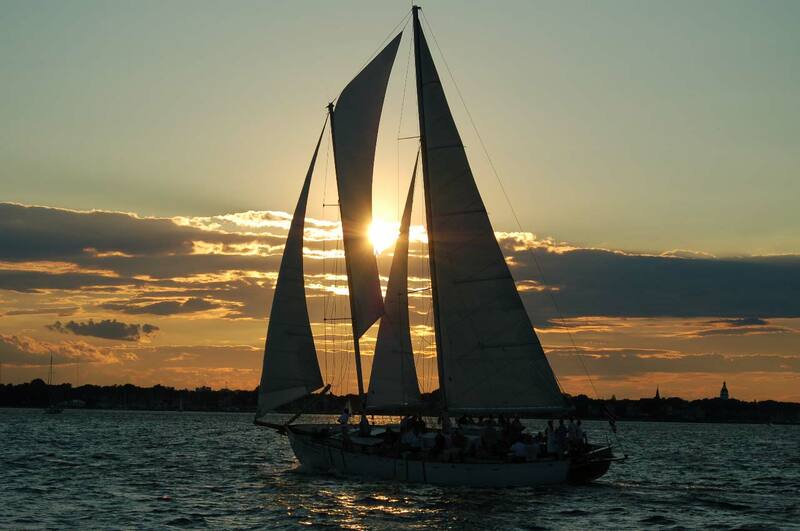 The Class B & C schooners finish at Windmill Point Light’s latitude line, 80 nautical miles. If they want to race for the perpetual trophy and bragging rights, they can sail to the bigger boats’ finish line at Thimble Shoal. The handicapping system for schooners: The reason the boats are “handicapped” is so that every boat has a FAIR chance of competing in the race, based on length, weight and sail plan and past experiences racing in various conditions. This formula is computed to “adjust” the seconds per mile each boat has for the length of the race. In our class, we “owe” every boat varying amounts of seconds or minutes or hours over the course length. This is because we are computed to be faster than each boat on an individual basis. New in 2017, the race was based on your boat’s rating factor times how long it took you to complete the race. So for this year, it was based on time verses distance. Schooner Columbia and Virginia just in front of us. This year’s race was unusual in many ways. First of all the race was postponed until 11:00 AM Friday because of the remnants of hurricane Michael. The course was shortened to 85 miles, the finish line being at Windmill Point Light House at the mouth of the Rappahannock River. 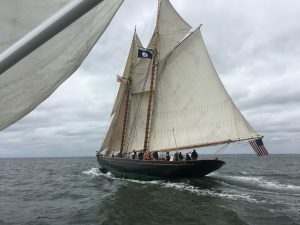 The fleet included several new entries including Class AA entry of Schooner Columbia which is a 2014 replica of the original Grand Banks fishing schooner. The start of the race for us was at 11:10 with the wind blowing from the North, 15- 25 knots diminishing to light air by the time we reached the northern stretch of the Potomac near Point Lookout. We were just a couple of boat lengths behind Wolfhound, Columbia and Virginia at the start. Columbia established an early lead leaving Virginia and Woodwind sailing neck and neck close enough at times to literally be able to pass the “Grey Poupon”! What a thrill to be sailing with her for over 2 hours and so evenly matched. This was surprising to me because last year she passed us with ease. We were sailing at hull speed, between 9 and 10 knots. A quick explanation is necessary of hull speed is important. The hull speed is based on a vessels waterline which in our case is 51 feet. It can be calculated by finding the square root of the waterline times 1.3. That number is 9.2 knots. When we are sailing at that speed we are encapsulated by a wave of 51 feet. Think of that wave as a barrier that we have to break through. The longer the waterline the faster the hull speed. Because we are relatively light, we can and have sailed faster, but it is still a barrier. We can reach that speed with relative ease because we have a generous amount of sail area. Virginia needs more wind than us to reach her hull speed and she did not have it this year. Last year she did and easily passed us. When the wind went lighter both boats slowed down. We compensated by putting up our spinnaker which Virginia does not have and we left her quickly to our stern. In fact the whole fleet was getting smaller and smaller except for Columbia who also set their spinnaker. Flying the spinnaker is difficult because the sail is set flying, like a kite. The lighter the wind, the more that the spinnaker wants to collapse. There was a lot of wave action off of the Potomac River with decreasing wind which made it exceedingly difficult to sail fast. Captain Mickey did a splendid job organizing the launching and maneuvering of the sail. He, along with Captain Jen, was also able to coach our crew to keep it flying. As we approached Smith Point Light which is the southern tip of the Potomac, the wind was forcing us to change course so that we would have to gybe. Gybing the spinnaker at night in the sloppy seas was not going to be easy, but hitting land was an option we did not care to explore. Jen was at the helm with about 5 minutes before we had to gybe. We all watched Smith Point Light shining on the wrong side of the vessel. Mickey had started to talk the crew through the maneuver when Jen interrupted with the announcement that the wind was shifting favorably. What a thrill as the shift turned us slowly in our desired direction. The wind continued to shift and strengthen forcing us to drop the spinnaker and sail back on rhumb line (shortest distance to the finish). For about an hour and a half we sailed fast with a fair breeze. Had we gybed sooner the shifting breeze would have had us sailing in a circle! Procrastination triumphed! Our Crew for 2018: Dan Hinchman, John Berry, Jack Pennington, James Oppy, Jen Bordelon, Nick Reinhold, Jen Kaye, Ken Kaye, John Freal, Mickey Lawlor, Sam Mortin and Rai Muhlbauer. I thought that was it. We would cross the finish in just a few hours. Nope! Again the winds died and the spinnaker went back up. This time the wind was forcing us to sail on the wrong side of Windmill Point. The wind did not shift and since we were relatively close to the finish line, we dropped the spinnaker and gybed under plain sail. We were grateful for the shortened course, turned on the engine and headed for Portsmouth. We were the second schooner to cross the finish line. This represents an incredible accomplishment. This is the result of excellent management of captains, navigators and crew. We kept Woodwind moving as fast as possible for the entire time. Schooner Columbia finished in 10 hours and six minutes. We finished one hour and 23 minutes behind her, and Schooner Virginia finished one hour and 35 minutes behind us. On corrected time, we finished second in our class. We left Baltimore at 8 AM on Thursday heading for the Bay Bridge. The skies were a dismal grey with a moderate breeze from the East. Our guest crew members, four of them, were being trained how to function in a new world centered around making Woodwind sail at her fastest. Peter and Bart had some sailing/boating experience in various types and sizes of vessels. Debbie and Richard had limited sailing on small boats and never in a competitive way or on an overnight passage. Just south of the Bay Bridge we waited for the start of the race. It was a magnificent sight to see over 20 schooners of various sizes and shapes. Some of these vessels are relatively faithful replicas of vessels that sailed for commercial purposes from the mid 1700’s to the early 1900’s. However, the AJ Meerwald is the original work boat that was built in 1928 and is still being maintained primarily using materials that are appropriate for her time frame. Woodwind starts in Class A. The first class to start is Class A and Class AA. The Pride of Baltimore II and Virginia (both in class AA) and Summerwind (class A) all have the potential to beat us across the finish line. 3 minutes after the start! During the last 10 minutes, when the prep, warning and start take place, is the period of fascination for me. I watched all the boats maneuver for the start. Jen is a master at putting the Woodwind right on the line as the starting gun is fired. This is no small feat considering she does this purely under sail, maneuvering among 11 other schooners, many almost twice our size. We nailed the start, being one of the first boats over the starting line and in the most favorable position. After the start, we discussed our possible strategies. We agreed that we stay as close to the straightest course down the Bay, a rhumb line course, between Annapolis and Thimbles Shoal Light House. No tacking or jibing. We had a lead, but we can see Summerwind and Virginia making gains on us. They are faster vessels for this point of sail with their longer waterline. Our only strategy is to keep our wind clear by making them pass to leeward of us, maybe we will even get lucky and slow them down enough with our smaller wind shadow. One hour into the race, Summerwind is first to make an attempt to pass. They are using their spinnaker which puts them at the upper limit of the stability of the boat. 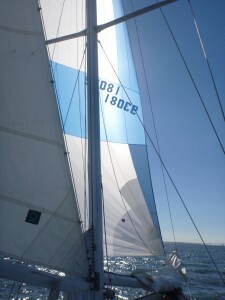 Their spinnaker is the first sail to feel our wind shadow and collapses and fills in a violent and vibrating pattern. Every time this huge sail collapses, the vessel shudders and slows down. They fall back and try to pass again. Again the scenario repeats itself. This continues for several more approaches. Finally, they crew lower the spinnaker as the wind gains in strength and they fall behind us with their sail handling moves. Virginia is next on speeding up on us and starts playing with Summerwind, but passes them quickly. Now it’s been one and a half hours into the race and here comes the 122-foot long Schooner Virginia. We also try to stay upwind of Virginia and hope we can stall them out too. But blanketing their sails is of little consequence since that boat has such superior speed and a much higher and larger rig (and 6300 square feet of sail area, Woodwind has 1800). What a gorgeous sight it was to see the Virginia sail close past us, well maybe not the passing part. Summerwind does pass us, and takes this photo! About two hours into the race, Summerwind makes another attempt. Under plain sail, the vessel is more stable and maneuverable and although she cannot initially pass us, she can head us higher into the wind (leeward boat has right of way) causing our sails to luff, which slows us down and then passes us. Next time we will have to use our cannon (HAH!). We look back at the Pride of Baltimore II, and think, oh great… here comes the next boat to pass us. She has everything up but we are still faster. Everyone settles into our watches and we trim for speed as darkness comes. The wind is between 100 degrees and 130 degrees off our bow or what is called broad reaching. The winds are getting stronger, between 20 to 30 knots true and what we feel is between 18 and 22 knots, since the wind is chasing us. As we get farther down the bay the waves increase, and come from behind us. Woodwind rises to the top of the wave and then surfs down the face of the wave and the speed increases. 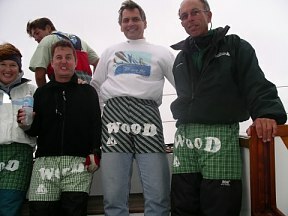 For some of our novice guest crew, it is a more than just exciting. These are conditions when the professionals need to take the helm and guest crew need to hold on. Rai and I are the navigators. Our job is to know where we are at all times, monitor wind strength and direction. We also need to know what the tides and currents are doing based on average predictions and actual conditions. We also have information about wind trends based on what is happening at weather stations and buoys. This was relatively easy this trip since the winds were holding to predictions and were steady. We all stand a 4 hour watch and on my off watch, I tried to catch some sleep. As I settled in my berth, I wedge my head on the pillow to keep me from rolling off. When I wake, I notice that we are almost flat. This a condition that usually means the wind has diminished. In my groggy state, in the dark, I wonder if we should set the spinnaker. I get up and look at our position and wind speed. We have passed Smith Point Light at the mouth of the Potomac River and our present course is farther off the wind, giving us greater stability. The wind has increased and we are now making more speed, hitting as high as 14 knots down the face of the waves. That is FAST! I have the last navigator’s watch which will encompass crossing the finish, at least if conditions hold. I announce to the deck on watch the possible span of time when we will cross. This is somewhere between 12:30 and 1:30 AM. We agree that we will wake the ship’s company 20 minutes before crossing. The excitement builds as we plow our way down the waves. I am watching the ETA change as we plummet down the side of the next wave at 14+ knots. At this rate we will finish in 30 minutes. As we slog up the face of the next wave, the ETA drops to an hour. And on we go until finally we are close enough to wake all hands. By now we can see Thimble Shoal Light sweep the horizon every 10 seconds and the lights from Norfolk become more distinct. As we cross the finish at 1:46:56 AM a cheer goes up and quickly we make plans to head for the harbor some 2 hours away. The order of finishing is Virginia first, Summerwind second and we are third. We correct out to 2nd in class, missing 1st by 6 minutes to Summerwind. I do not want to bore you with the details, but there is a handicap system which is quite complex. In fact it is the first time she has beaten us, boat for boat, across the finish. We are quite pleased with our finish. This is our second fastest race by just 10 minutes. 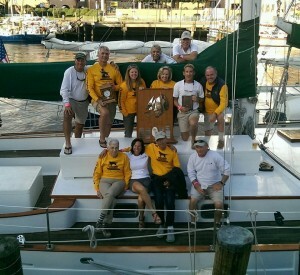 Virginia broke their own speed record for the fastest finish in the history of the Schooner Race, finishing in 11 hours and one minute! Congratulations to them! Guest Crew: Richard and Debbie Williams, Peter Ennis, Bart Huxtable Crew: Ken Kaye, Jen Kaye, Rai Muhlbauer, Mickey Lawlor, Sage Dompineo, Judy Huxtable, Caitlyn Foster, Charlotte Faracai. Unfortunately, there was no write up this year, for some reason. We were first over the finish line, corrected to second in our class, second place overall and finished in 17 hours, 15 minutes and 33 seconds. Light Reign, a Cherubini Schooner took first place in class and overall. Our guest crew was Gillian Crisp, Christine Stadter, Leslie Bach and Paul Vitilio and our crew was: Ellen Kaye, Ken Kaye, Jen Kaye, Sam Meyers, Josh Pearl, Mike Winnick, Rai Muhlbauer, Mickey Lawlor. Race results PDF. Looking at the conditions this year, the wind started from the North (from behind), in light air, then dying off and turning South, against the direction of desired travel and strengthening to moderate – strong conditions. Finally, by early morning the wind shifted to the West, with moderate strength, which is the best direction for fastest sailing for all members of the fleet. Because of the wide variety of conditions, most vessels were able to finish within the time allotted. I must praise our watch captains, Mickey Lawlor and my daughter Jen for directing crew to adapt to the changing conditions. When the wind came from behind we set our spinnaker (the first to do so). When the wind moved forward we dropped the spinnaker. In fact, conditions for the first several hours were so variable in direction that we set and dropped the spinnaker 4 times! Finally around Cove Point (just North of the Patuxent River) the wind turned on the nose and we set all our working sails (jib, fisherman, main staysail and main). Through the night, as the wind strengthened, we stretched out our lead. The seas became lumpy, like driving into pot holes. It was exciting sailing, as Woodwind beat into ever larger seas. The boat was at 20 degrees of heel and every so often we would fly off a wave, land with a bone jarring thump followed by a ripple effect vibration from the rig, from bow to stern. While this is all normal and perfectly safe, for those on the off watch, sleeping was an art form. Every time I nodded off to sleep for 30 seconds, my dreams became violently interrupted by the reality of the ships motion. Every time Woodwind tacked, over our heads could be heard the shout of commands, the grinding of winches, and lines being dragged across the deck. The sails crackled as they fluttered from side to side and then tightening to assume the new position. The more tired I became, the more vivid and ridiculous the dreams. During one tack, the wind socked us unusually to one side, launching 4 cucumbers in the air to rudely awaken those crew who could sleep. All this noise and movement seems so incredibly loud and violent down below. When it is was my turn to go on deck, the noise subsided into a logical background symphony of sound as Woodwind sliced her way South. The stars shown bright and even the Milky Way made its appearance in the clean cool atmosphere above our heads. Wild ride in the morning! 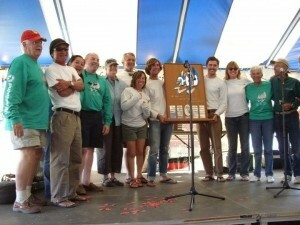 The crew and the trophies: 1st Overall, 1st over the Finish Line and 1st in Class! When the race was over and I was able to analyze our journey and our sizable victory of over an hour over all of our competitors, I knew that we had won not just because of Woodwind’s innate speed, but because of our captains and navigators, keen judgment as to how to sail the boat fast and our crews well developed skill honed to perfection by a season of practice including match racing both vessels every Wednesday. Lastly, to our guest crew who stood watch like the rest and following our lead to keep the boat moving. They trimmed sails, did boat checks, helmed the boat and so much more. Thanks to Guest Crew: Tim and Nancy McGee, Jack Tatelman and Michelle Lucas. And thanks to our Woodwind Crew: Ellen Kaye, Jennifer Kaye, Mickey Lawlor, Pat Smith, Tim Lindsay, Tom Stalder and Rai Muhlbauer. The start of the Schooner Race 2014. Adventurer 65, 1926 John Alden designed schooner, parading into Baltimore Harbor. Photo by Mark Talbott. After going through our checklists, making sure everything and everyone was onboard, we left Annapolis around 10:15 AM bound for Baltimore. This 4 hour trip gave us time to practice a little with the spinnaker in case we would need it. But, the forecast was for light winds out of the South/Southeast which was not exactly spinnaker weather. It was forecasted to change later at night to become North/Northwest, which is great for flying a spinnaker, providing it’s not too breezy plus in the dark. A front was scheduled to come through with some possible rain as it passes. What a fun party at Bo Brooks Tavern for all the Captains and Crew. We love catching up with our sailor friends, many of whom we haven’t seen since last year’s event. Our boat builder, Rick Scarano, was there representing their newest schooner, America 2.0. This year, America 2.0, was put in our class at the last moment, even though she owes us nearly 2 hours in corrected time and owes some boats over four hours! The race committee decided, that although she’s the size of Class AA schooners, her hull design is more aligned with the modern designs in our class, Class A. Wine delivery from Woodwind II before the start of the Schooner Race. Photo by Mark Talbott. We left Baltimore just before 9:00 AM to head to the starting line just below (south) the Bay Bridge. The start was at 1:40 PM, so we had time to get there and to swing by Woodwind II to pick up our forgotten wine! She was full with “spectators” hoping to get some really great photos of the start of the race and to cheer us on. We made up our watch system: 4:00- Mike Oh (watch captain), Ellen Kaye, Rich Trevelyan (guest), Don Williams (guest), Mark Talbot (crew). 8:00- Jen Kaye (watch captain), Trudi Muhlbauer (guest), Teresa Williams (guest), Chris Greco (crew), Frank Anderson (crew). Navigators: Ken Kaye and Rai Muhlbauer rotated in between watches. Thirty minutes before the start, the winds went really light from the South. This meant we’d all be tacking down the Bay, plus we had a strong current flooding up the Bay, so we would be sailing against it as well. This is not a good combination at all! Two minutes before the starting gun, we were perilously getting swept too close to the starting line without any room to maneuver because all the boats were jammed in tight. We had Mystic Clipper just to leeward of us and Pride to windward and a little astern. Fortunately, we weren’t over early at the gun, but it was not one of our best starts! Very close competition as we tacked down the Bay. Crossing our bow is America 2.0 and Apella. Photo by Mark Talbott. We had to work hard to tweak the sails in the very light winds and keep sailing in the shallower western shore where there’s less foul current. After a few hours, we found ourselves exchanging tacks with a couple of competitors in our class, Apella, Prom Queen and America 2.0. Since America 2.0 is a gaff rigger, she can’t sail as close to the wind as we can, so although she was sailing faster than us, our tacking angles were closer to the wind. In addition to the more favorable “pointing” ability of Woodwind, the breeze had picked up so progress against the current was possible. At this stage of the race, it was exciting to be close to other competitors. It was also concerning since we owe Prom Queen over two hours on corrected time. We were delighted with a gorgeous sunset as Woodwind raced down the Bay. Photo by Jen Kaye. After darkness set in, the wind conditions increased from the same direction. We also had a fair tide. We were still able to keep track of America 2.0, not losing any “ground” to her. 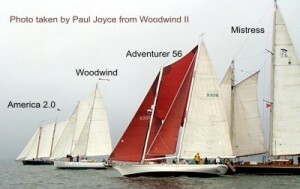 With the increased wind, the other two schooners (Prom Queen and Apella) fell further behind. After midnight, the wind began its turn from Southeast to South to Southwest to West over a span of several hours. This required constant vigilance for trimming sails, course corrections and strategy. When the nearly full moon was able to peek out from the cloud cover, it helped in seeing and trimming sails! Otherwise, it was flashlights on the tell-tails. Friday’s sunrise and sailing over 9 knots with Thimble Shoal, the finish line, in sight. Photo by Mark Talbott. Once tacking was no longer in play, we realized that America 2.0 was going to shoot ahead at her faster hull speed. Plus it was too much wind for us at times to even use our fisherman as we had gusts over 25 knots true wind. We finally finished close by to the Thimble Shoal light at 7:48:49 AM. We never used the spinnaker. When we arrived at the docks in Portsmouth, only America 2.0 was there. We were also greeted by a very high tide with water over the docks! The Saturday party was excellent as usual, with sailors talking about the race and catching up on news from the past year and enjoying the food and beer. At the awards, we placed second to America 2.0 on corrected time in our class. Had we not had a 10% penalty for winning first last year, we would have lost by only 6 seconds instead of almost 9 minutes corrected. 2013 Team Woodwind: left to right, top to bottom: Mike Oh, Rai Muhlbauer, Ken Kaye, Mark Talbott, Rich Trevelyan, Don Williams, Teresa Williams, Jen Kaye, Ellen Kaye, Frank Anderson, Trudi Mulbauer, and Chris Greco. Photo by Woodwind! We had our usual Rum Punch party after the awards, and, again, it was a very high tide so folks had a high climb to board on and off our boat. Also, I always get a kick at how low we actually sit in the water when we have so many onboard at the same time. 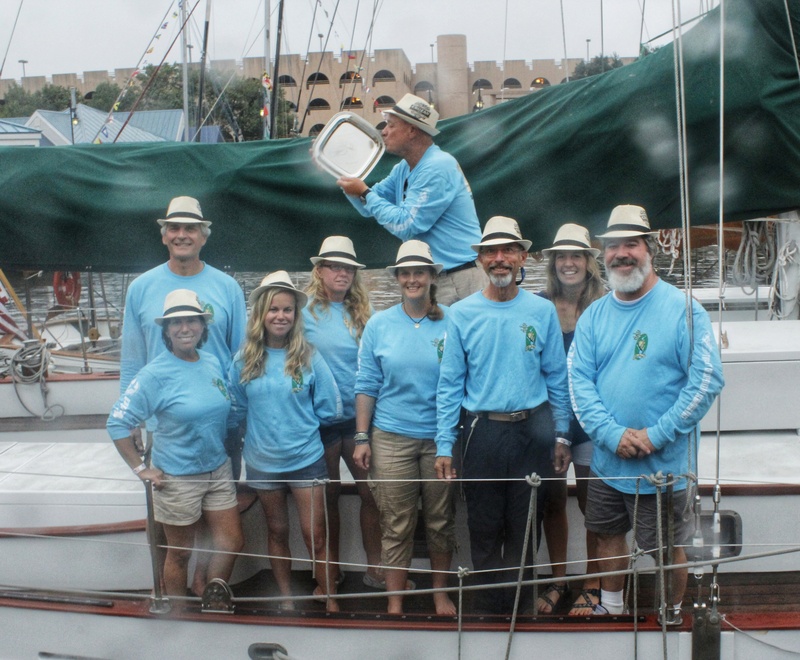 This year’s race was very special for many, many reasons, but a few special ones come to mind: First and foremost, it was extremely well managed by the watch captains and navigators, including all the preparations in the two weeks prior done by Mike, Ken and Jen. Second, we had experienced Woodwind guests and friends: Teresa and Don Williams (previous race), Rich Trevelyan (previous race, Adventure Cruise and Jen’s boyfriend) and Trudi Muhlbauer (previous race and Rai’s wife and dear friend since the ’80’s). It was a great time for all! 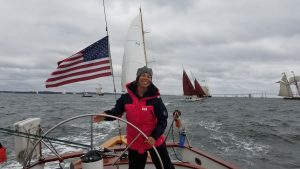 Ellen Kaye, co-owner: I want to preface this account of this year’s schooner race. Unfortunately, I hadn’t been able to participate in this race for the past two years due to personal emergency situations. It was exciting for me to be back again this year and decided it would be fun to write this article this year! 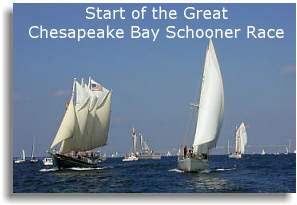 For me, the twenty-third Great Chesapeake Bay Schooner Race actually began about seven days before its October 11, 2012 scheduled start. It was then that I began to earnestly keep a close watch on predicted weather patterns for the start. Hmm, northwest winds, shifting more southerly as the day wore on to dusk, and then southwest for at least 6 plus hours throughout the night before shifting back to the north again sometime after daybreak. The wind speeds were also forecasted to be less than 15 knots. How perfect for Woodwind! She was bred for these conditions. As the days passed, the forecast held. Schooners behind us with very little breeze, after the start. 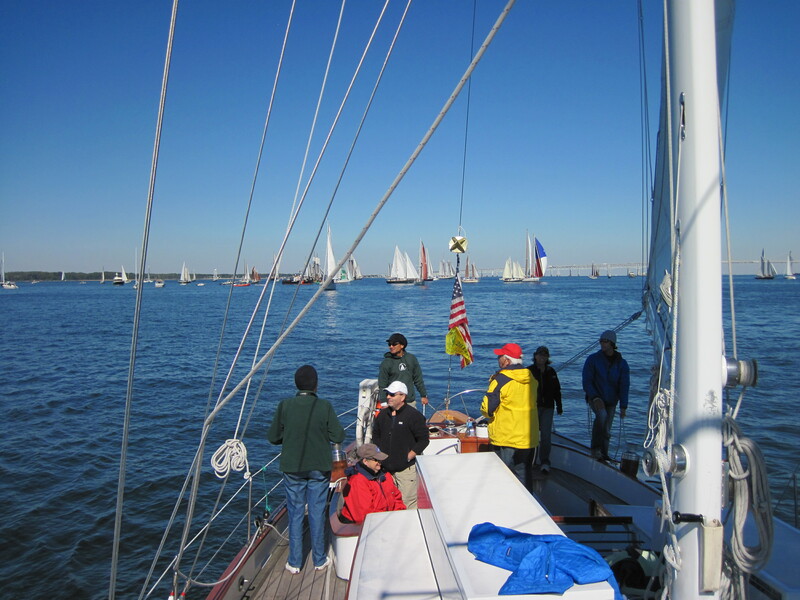 We departed Annapolis on Wednesday, October 10th ( Captain Ken’s birthday), for the rendezvous in Baltimore and the Parade of Sail in the inner harbor. The weather was perfectly cooperative for this colorful parade of more than 20 schooners, many of which fired their cannons during the turnaround near the Constellation. The sailor’s party was fantastic, as usual, giving all a welcome moment to catch up with fellow sailors, many of whom we haven’t seen since last year’s race. 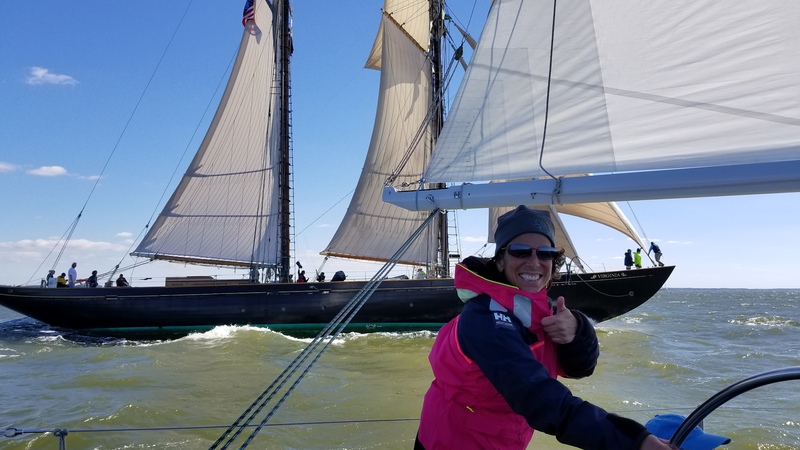 After awakening and devouring Jen’s egg and roasted vegetable torte, we departed Baltimore for the starting line between the Bay Bridge and Annapolis Harbor entrance for the 1:40 PM start time for our class (Class A). It’s amazing that the 7 day forecast was still the current forecast for the race weather conditions. We were all psyched! 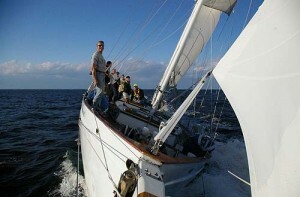 We had great Woodwind crew onboard, great guest crew and a great schooner. I felt we had a special magical combination. Five minutes before the starting gun, the wind died to barely a zephyr, and we waited endless minutes to actually cross at the start. Once we got some wind, we accelerated quickly ahead of the fleet and never looked back. Well, to be honest, we did look back, but after a while, the fleet looked pretty small behind us. The southwest wind arrived on schedule, perhaps a little early! The wind started picking up after 10:00 pm to just under 20 knots. This breeze lasted until less than 5 miles to the finish line. We easily tacked our way down the bay in light to medium winds. Fortunately, there was light commercial ship traffic during the night. We were anticipating the wind shifting back to the west and then to the northwest. Our main tactic was to keep away from the mouth of the Potomac during the flood tide, so we favored the more easterly shore. We also decided that when the wind would shift to the west, we would be better off on a more eastern location for the finish line at Thimble Shoals light, which is a latitude line stretching from the light clear over to the eastern shore, passing through parts of the Chesapeake Bridge/Tunnel. Friday morning after daybreak was when the shift would take place. The shift had started for the fleet behind us much sooner than it started for us. We surmised this by checking the buoy wind reports from locations around the bay. We were waiting for our turn. Finally, we got our shift, slowly lifting us, without having to throw in another tack, to the imaginary finish line. We were the first schooner across the line. It wasn’t until more than 2 hours later that another schooner finished. See official results here. At the awards pig and oyster party on Saturday in Portsmouth, we achieved something truly amazing. We won first in our class, we won first to finish (and received a beautiful handmade mantel clock by RML Clocks), and first of all boats on corrected time! The party was awesome as usual and our rum punch party afterwards onboard Woodwind was really well attended in spite of a high tide and a tall climb aboard for some. Perhaps disembarking wasn’t as easy? Great pictures from the Race, click here! This year’s Race was the perfect combination of unforgettable elements: The perfect boat, perfect weather, perfect crew (Ken Kaye, Jen Kaye, Mike Oh, Rena Kazmierski, Daniel Zech, Sam Eckert, Rai Muhlbauer and myself, Ellen Kaye), perfect guest crew (Russ Branton, Joyce Van Den Berg, Jim & Barbara Fay), great food, great hosts/volunteers (Portsmouth and Baltimore) and great camaraderie. You can’t beat that, either! 30 Schooners Started the Race, 15 Finished. Almost 26 hours for the race ! Our competition: We normally race against the same schooners every year. Heron, Prom Queen, Adventurer 56 and Mistress are all very capable of winning the race depending on the conditions on race day. The 74-foot, gorgeous schooner Brilliant (1926 Sparkman and Stevens) was back this year competing for the third time. We raced against her in 1993 and she beat us by more than an hour, but in 1994, we beat her by a half an hour. Scarano Boat Builders’ replica of the Schooner America was a new entry this year. She was designed and built to be light and fast just like Woodwind, but she has a 20-foot longer waterline which would make her tough to beat. The race: The prediction for wind this year was 5-10 knots from the southwest, building to 15 knots by late Friday. We all were led to believe that this would be one of the longest races in the history of this schooner race. At the start, we had drizzly conditions with winds of 10 knots. As always, we wanted to have full control as we jockeyed for position at the start. Our main concern is to have a clean start at the front of the pack with clear air. 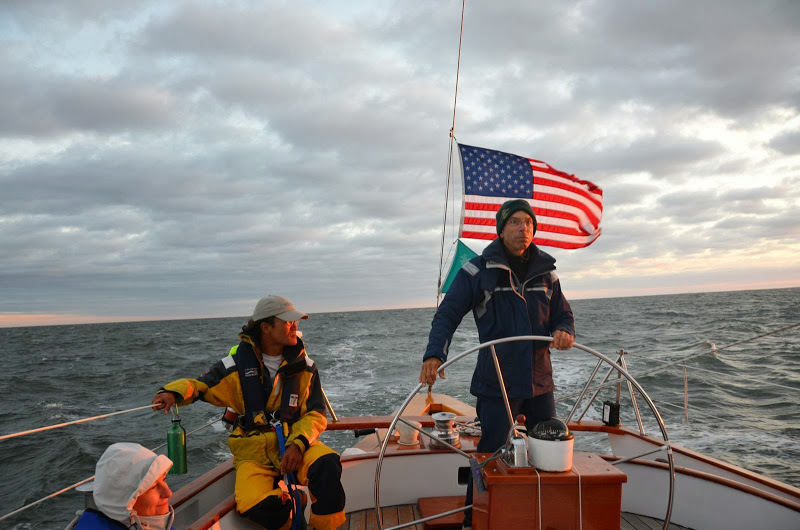 As we were setting up for a terrific start, America 2.0 sailed near us and was clearly going to push us off the starting line to keep a clear air start. Captain Jen made a wise decision to back out of the confrontation and fall off to her stern. Watching all the boats in our class stack up to leeward between us and the pin boat (Norfolk Rebel), we had to get a little clear air to be able to go forward. Just at the right time, the wind gave us the boost we needed so we pulled out in front of the oncoming Adventurer 56 and Mistress. The wind was coming from the east to south east so we wanted to stay in the shallows in order to get out of the current against us. America 2.0 took off like a shot in front of us, but we were ahead of the pack of boats behind us. Click here to watch the replay of the race from the transponders that were on all of the boats! The wind varied in strength and direction, but mainly came from the direction we wanted to go, causing us to tack the whole way down the Bay. Around 4:00, the rain and cloudy skies departed and the sun came out giving everything that golden glow. We were in second place as nightfall hit. Our boat speed went from 8 to 5 knots as the night went on. Whenever we got close to land, the breeze seemed to decrease. In racing, you need to push your boat constantly. We continued to check the tell tales and the pennant’s direction to make sure we were heading as close hauled as possible. There were no other schooners within 3 miles of us, so we stayed with our strategy. When the clouds parted and the moon came out, it was so bright that you could see your sail trim pretty well. There were thunderstorms over land that we could see in the distance all night. Luckily they never came our way. It was unusual to see the sun rise while still more than 50 miles from the finish line. We had not had that happen in at least the past five years. The wind started to build as the sun rose and we found ourselves in the middle of the Bay. We had the current against us and we were heading into the building seas. By the time lunchtime hit, we were 20 miles or so from the finish line and we were now close reaching at speeds near 10 knots! It was warm and sunny, and the winds increased past 30 knots causing us to take down the fisherman for the fourth time. We finally finished at 3 pm and did not see any other boats. A wonderful, large welcoming committee was there to greet us in Portsmouth, Virginia at sunset! America 2.0 was sitting at the dock, and Prom Queen was close behind us in docking order. Once we had docked and eaten dinner… showers and sleep were first on the list. The race took us 25 1/2 hours this year. This is about 10 hours longer than it has taken us in the past five or six years! We want to thank our fabulous crew made up of Ken Kaye, Jen Kaye, Rai Muhlbauer (navigator), Mike Oh, Rena Kazmierski, Sarah Buhlman, and Aubrei Barton and guest crew Mark Talbott with guests Hope Andruss, JoAnn Lovell, Cynthia Hooper and Chris Wood. You are all terrific! Windy Start to Doldrums in the first hour, absolute downpour to gorgeous sunset in 4 hours, 8 sail changes during the race of just under 14 hours. The wind was howling once again, and a cold rain fell on the schooner fleet of around forty boats. The wind this year was about 15-25 knots from the East for our start. We wanted to have full control as we jockeyed for position at the start. Our main concern is to have a clean start at the front of the pack with clear air. If we have this, then we can hold on to our lead for as long as possible. 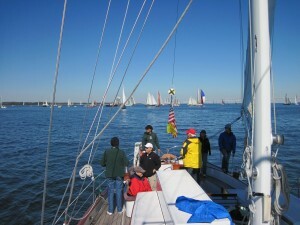 We had a terrific start and put all four sails up immediately after crossing the starting line. 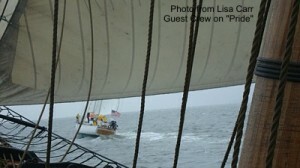 We were the first schooner over the starting line, with “Pride of Baltimore II’s” bowsprit barely behind us. We had to edge out a lead on her for fear of her walking over us and burying us in her gigantic wind shadow. The view of the Pride of Baltimore from Woodwind just after the start. About a half hour into the start, a squall line approaches and depletes our sails of all wind. Then the downpour came, like hitting a wall of rain as Captain Jen describes it. After about a half an hour the wind started to come back from the north, and we noticed some spinnakers popping out behind us. We were abeam of Thomas Point Light and hardly moving. Aboard the Woodwind, our crew cannot wait till we are out of sight of Thomas Point Light and out of our public tour sailing grounds. We decide to hoist our .75 ounce spinnaker that we borrowed from Nicole Weaver, who fortunately was crewing for us a second time. We started to pick up speed as the wind started to increase. “Pride of Baltimore II” was following behind us dueling with the new entry “Summerwind” from the USMMA Spinnaker up aboard Woodwind(King’s Point), a gorgeous Alden designed schooner built in 1929 with a total refit of more than 10 million dollars. “Summerwind” has a very modern rig, even more so than Woodwind, and to see both “Pride” and “Summerwind” protecting their wind was amazing from a half mile to a mile back. 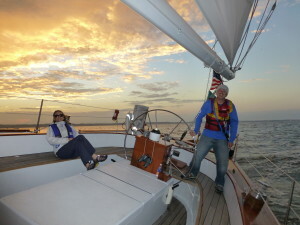 “Adventurer”, Art Birney’s Cherubini schooner, was slightly Sunsetbehind us but taking the middle of the Bay. We were holding our own as dark fell upon the fleet. “Pride of Baltimore II” was starting to pull ahead as they pushed “Summerwind” to jibe away and the wind funneled from the North, more directly down the Bay. The rain gave way to a gorgeous sunset right after our spinnaker blew up in the rising wind. Through the night, we had to keep pushing the boat. We set the 1.5 ounce spinnaker, and it worked well, but we worked tirelessly to try and set the spinnaker with the fisherman then without the fisherman, with the staysail and then without the staysail. But after four attempted jibes throughout the race, none of them pretty, actually most of them quite ugly, we decided to go back to the Woodwind’s speed combo of her normal full complement of sails (without spinnakers). The stars were gorgeous and they guided us down the Bay, along with a half moon. We were treated to the moon set which looked like a tangerine slice melting into the dark black sea. We knew at some point we were passed by “Summerwind” and “Adventurer”. But there was an award that was given out that totally took the Woodwind crew by surprise. It was the BLACK DOG trophy, which is given to a person or persons that have shown Pride and Commitment to the Great Chesapeake Bay Schooner Race. The Kaye family was called up to the podium to accept the trophy. The trophy was named after founder, Lane Briggs dog called simply, “Black Dog”. 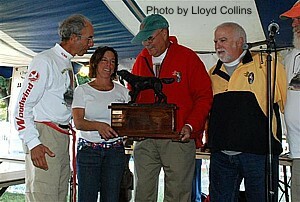 He was so loyal and committed to Lane Briggs, that they made this trophy up for the Schooner Race. We are so proud of this accomplishment. The activities in Portsmouth were wonderful as always with all of the volunteers being so supportive and wonderful. The oysters were outstanding! And the Rum Party this year aboard Woodwind was graciously sponsored by Pusser’s Rum. 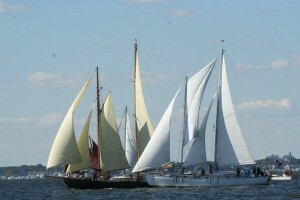 More photos of the 2010 Great Chesapeake Bay Schooner Race. Thanks to a fabulous crew made up of Ken Kaye, Jen Kaye, Rai Muhlbauer (navigator), Lorena Kazmierski, Leslie Heins, Mark Talbott and Matt Cruder and guest crew Nicole Weaver with guests Mickey Lanigan, Lloyd Collins, Don Williams and Richard Trevelyan. The wind was howling and a cold rain fell on the schooner fleet of around fifty boats. The wind was about 15-25 knots from the NE for our start. This year was a different start than years past. There was only one committee boat, and the start extended from that boat to a latitude line across the Bay. We had a terrific start and put all four sails up immediately after crossing the starting line. We were probably one of the first schooners over the starting line, well on the western shore side. About an hour into the start, we raised the 1.2 ounce spinnaker that we borrowed from Nicole Weaver who fortunately crewed for us as well. We sped down the bay at a speed of nine to ten knots. Pride of Baltimore II was following behind us and Juno, a gorgeous private schooner built in 2003, was behind her- also under spinnaker. Virginia was further behind than the other two boats. We were holding our own as dark fell upon the fleet. Pride of Baltimore II was starting to pull ahead as the wind funneled more directly down the Bay in a more northerly direction. Through the night, we had to jibe several times as we headed down the Bay. Once for fish traps, once for a freighter that tried to run us off the “road”, and once to try and keep ahead of some of the shifty breezes. It was a really dark night, and the phosphorescence churned up by the whitecaps looked like little icebergs floating on top of the ink black waves. There were no stars in the sky, just rain, and an icy breeze. We kept hearing Pride, Virginia and Juno talking with each other on the VHF radio and realized we were close to them by the finish. We ended up finishing the race in about 15 hours. This was 43 minutes behind Pride, 6 minutes behind Juno, and 3 minutes ahead of Virginia. 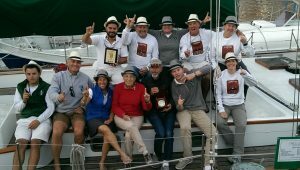 Roger Worthington’s schooner “Prom Queen” (seriously, this is the name of his boat- his dinghy is named “Runner Up”) finished an hour later but corrected over all of the schooners to win first overall (full results, click here), while we placed second overall for the entire fleet! Thanks to a fabulous crew made up of Ken, Jen, Ellen, Rai Muhlbauer (navigator), Katie Fitzgerald, Jocelyn Craig, Scott Schopman and guest crew Nicole Weaver with guests John Haller, Paul Dills, and Tom and Mary Conner. 2nd Schooner over the Finish Line, but corrected to 6th in class! The starting area was filled with the most schooners in the history of the race and many, many spectator boats. 54 traditional and non-traditional schooners had entered this years race! The wind was about 5-8 knots of wind from the SW for our start. The predictions were that the wind would change to the NW then to the NE and increase in speed as the evening progressed. The bunch up of boats at the starting line was impressive. We were a little too early to the line, so we started to get blanketed by the wind shadows of other boats. We pushed our way through the masses of sail area, and finally got into clear air. 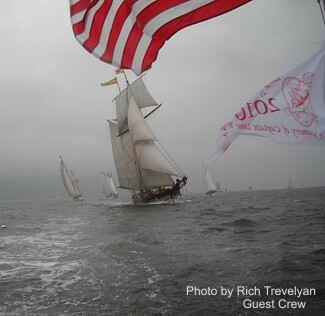 This photo was taken from the crew of Schooner Virginia, while aloft in their rig. Notice our spinnaker. About fifteen minutes later the wind was so shifty that we could tell that there was a wind shift coming sooner than later. The wind picked up to about 13 knots from right out of the Severn River (NW) which led us to be one of the last schooners to catch the shift and the wind. When we got the wind, we started playing with the gorgeous schooner, Virginia. When the wind shifted more from the stern, we decided to raise our spinnaker. While we were doing this, a crewmember from Virginia was aloft to document our spinnaker set. Spinnaker Set on Woodwind taken from the Schooner Virgina. We held that spinnaker up until well into the night when the wind speed increased, and we got nervous the sail would blow to pieces. The wind & waves picked up and we gybed down the bay. 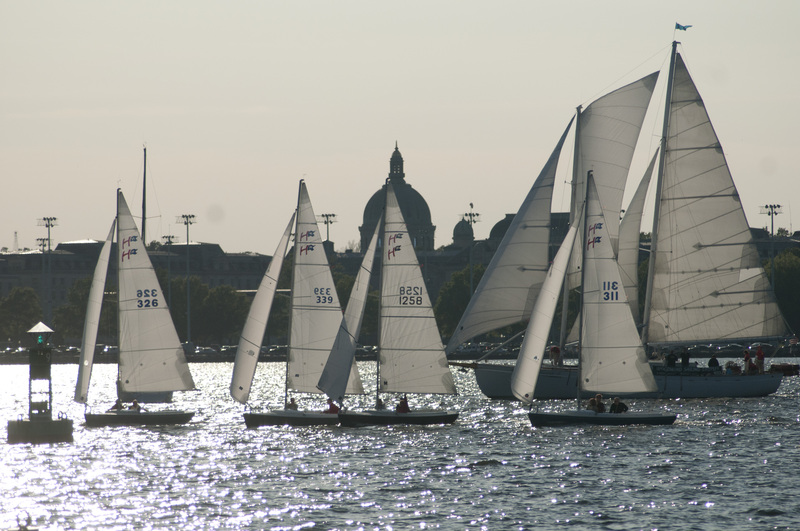 Pride of Baltimore II & Virginia started match racing down the bay, 2 boat lengths apart constantly lead swapping. Pride gybed in front of us 40 miles from the finish line and we only saw that one boat in front of us. In the morning light, the Virginia was nowhere in sight. We found out later they broke their main gaff (top boom of their mainsail) and finished without the use of their huge mainsail. We ended up finishing at 6:39 am, with Pride of Baltimore II finishing 23 minutes ahead of us over the finish line. The next boat over the finish line behind us was Heron, who ended up correcting over us by a handicap formula. After all the boats finished, we were sixth in our class. We finished in basically 17 hours. Thanks to a fabulous crew made up of Ken, Jen, Ellen, Rai Muhlbauer (navigator), Katie Fitzgerald, Katie Nash, Pete Schmaus, Brady White, and guest crew Paul and Gary Heaton, Deanna Griesemer and Le Perry. The Year of a “Perfect Race Down the Bay”! 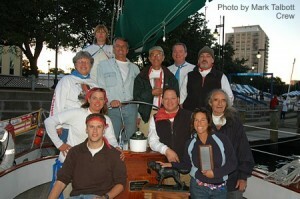 We left Annapolis for Baltimore on Wednesday, Oct. 10th, Captain Ken’s birthday. We had little wind so we motored our way up to Fells Point. 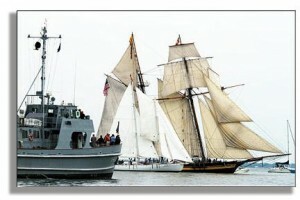 The parade of sail was breezy enough to set sails as 40+ schooners sailed through the inner harbor firing cannons. The party at Fells Point was fun, but it was really warm inside the Latin Palace. In fact, the weather outside was unusually warm for October! All the schooners left the docks on Thursday for the 1:30pm start just south of the Bay Bridge. We had a breezy WNW wind that was building in strength nicely. As Captain Jen maneuvered for the start we decided to hoist our new fisherman sail after the start so we could more easily maneuver for best starting position between the two Navy YP boats making up the starting line. We were a matter of a few seconds from the line at the “start” and quickly flew ahead of the rest of Class AA and A schooners. Once the fisherman was hoisted and drawing, we began the perfect trip down the Bay. Perfect wind speed, perfect wind direction, perfect crew and perfect passengers. We never tacked, gybed or changed sails as Woodwind surfed down waves in a synergy of sailing forces that sailors can usually only dream about. At one point when the wind seemed to pick up in strength to about 30 knots, Captain Ken considered taking down the fisherman. 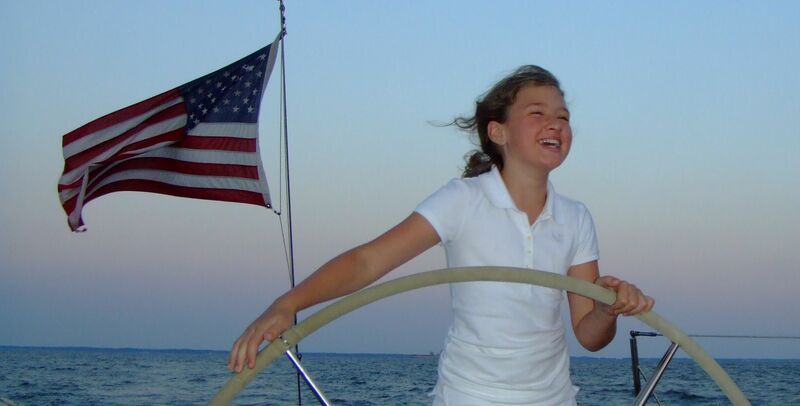 According to Captain Jen, “We never shortened sail. 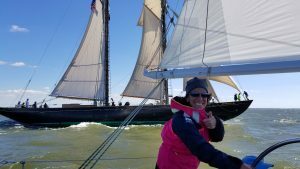 We had all four sails up the entire way.” Jen, who also serves as Woodwind’s chef, was cooking dinner on Thursday evening when she heard her father having a discussion about reducing sail. “Let’s think about taking down the Fisherman,” Ken said. Jen, unaware she was still carrying a galley knife, scrambled on deck to admonish her father for such a thought. “I said something like “Don’t even think about taking down that sail” and I had this knife in my hand. I think the passengers must have thought I was crazy,” Jen said with a laugh. Sailing a straight rumb line course, we finished in our record time of 11 hours, 55 minutes, ahead of any previous course record set. We corrected to 1st in our class after crossing the finish line well ahead of the other boats in our class and just behind the Pride of Baltimore II. Since most boats arrived in Portsmouth in the early morning hours of Friday, there seemed to be an additional day of partying and sleeping! Thanks to a fabulous crew made up of Ken, Jen, Ellen, Dan, Rai Muhlbauer (navigator), Andy Schell, Tiffany Talsma, Scotty Hanley and guest crew Mike and Deb NcNelly and Joe and Joan Warren. What a sweet memory! The Year of a “Little Bit of Everything” and “More Than We Asked For”! 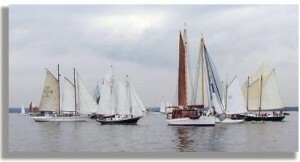 A southerly breeze quickly propelled Woodwind up to Baltimore for the Parade of Sail. Upon arriving in Baltimore,we boarded some folks for the Parade of Sail,including our liaison Carolyn Mollenkopf, with her bag of goodies, including her brownies-to-die-for, and her fun personality. 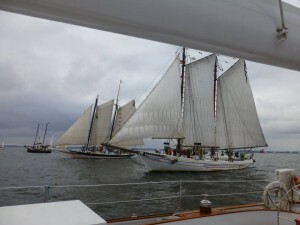 We paraded around with 38 other schooners including the Pride II and Virginia. Many of the vessels fired cannons, including us, and it was the noisiest parade in memory! 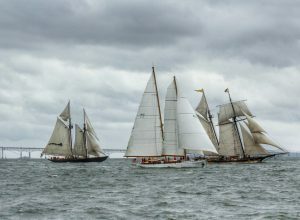 The 17th Annual Great Chesapeake Bay Schooner Race started with a light northerly breeze as the boats sailed down from Baltimore to the starting line just south of the Chesapeake Bay Bridge near Annapolis. The starting line consisted of two anchored Navy YP (Yard Patrol) boats. We jockeyed for position at the starting line, staying away from all the big schooners that carry tons of sail area that would steal our breeze. We had a terrific start (1:40pm) as the 1st boat over the starting line tied with Sultana (as a historic, heavy boat, she kind of just sat there at the line). 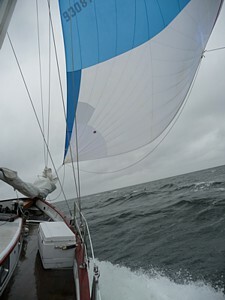 With the wind gently out of the north, we flew our asymmetrical spinnaker. This kept us in front. Close by us was Adventurer, a Cherubini owned by Art Birney, with her spinnaker. but the wind began to lighten to barely a zephyr. Our speed went down to less than 2 knots and behind us we could see the smaller boats who were just starting had trouble even making it to the starting line! An hour later, the wind then increased a bit but from the south and we picked up speed as we tacked our way down the bay, exchanging tacks with Adventurer. They gave us an “arghhhh” and we kindly replied. The rest of the fleet fell further behind. Then the wind built to a steady 20+ knots, perfect for us which lifted our course to a perfect rum line down the bay while sailing close-hauled. We pulled ahead of Adventurer as she had to reduce sail area, while we had all 4 sails up. Our speed was between 8 and 9.5 knots! About 8 PM a dramatic wind shift took place from the NW packing 30+ knot winds. Since it was dark out, we couldn’t tell the shift was coming. We were knocked on our beam’s end, then finally eased our main and bore off on a broad reach. We reduced sail to just Jib and main, then later adding our staysail. Since there were only 4 crew on deck, we were concerned about adding more sails. Finally at the turn of the next watch (shift) with 8 hands on deck, we flew all four sails. Jibing down the bay we hit a high speed of 15.5 knots. 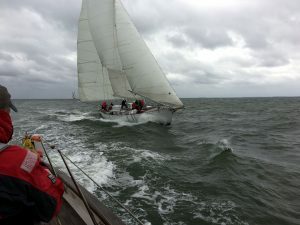 During the last 4 hours of the race, Pride of Baltimore II passed us and was 20 minutes ahead at the finish, first to finish. We finished next and Virginia was behind us. We were not able to cover our time on Adventurer and Heron and finished 3rd on corrected time. If we had sailed more aggressively immediately when the shift occurred (not shortened sail) we might have won in all categories, but hindsight is always 20-20. Just to give you some insight as to hard Heron sailed, she carried her .8 ounce spinnaker after the shift occurred. Our spinnaker is rated at .5 ounce and would have shredded to bits and pieces. A terrific and safe effort by all of our crew! Aboard: Cptn. Ken & Ellen Kaye, Cptn. Jen & Dan Brest, Rook Singer, Andy Schell, Linda Ramirez, Rai Muhlbauer, Kimberly Hellebush, Paul Dills, Toby Washington and Pam Bible. Woodwind Reaches Her Fastest Speed Ever During the Race! A terrific northerly breeze quickly propelled Woodwind up to Baltimore for the Parade of Sail. Our captains and crew took advantage of the favorable breeze and trained our guests on sail handling and helming throughout the day. Upon arriving in Baltimore,we boarded some folks for the Parade of Sail, including our liaison Carolyn Mollenkopf, with her bag of goodies, and her fun personality. 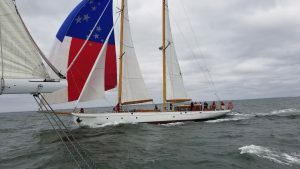 We paraded around with 35 other schooners from the gorgeous 122-foot, Virginia to the smallest schooner in the fleet, the 32-foot, Ann Elizabeth. 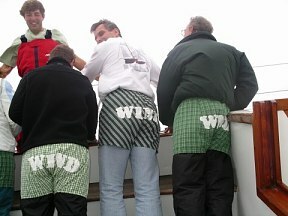 Our crew made boxers for us to show off, this is the front. 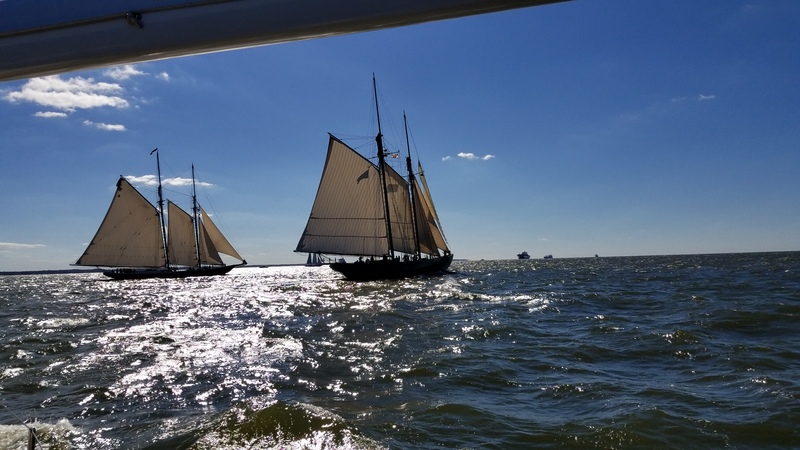 The 16th Annual Great Chesapeake Bay Schooner Race started with a strong northerly breeze as the boats sailed down from Baltimore to the starting line just south of the Chesapeake Bay Bridge near Annapolis. The starting line consisted of two, anchored Navy YP (Yard Patrol) boats. We jockeyed for position at the starting line, staying away from all the big schooners that carry tons of sail area that would steal our breeze. We had a terrific start (1:40pm) as the 1st boat over the starting line, followed closely by Imagine. This was the back of the boxers! 20-22 knots, the wind conditions were ideal for gaff-rigged schooners and heavy air spinnakers. 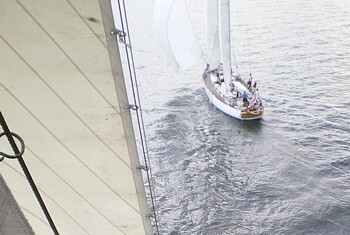 In fact, many of the gaff-rigged schooners sailed “wing and wing” so they could run directly downwind, straight down the Bay (see picture below) Woodwind has a staysail rig that makes sailing directly downwind, slow and unsafe and the wind was blowing too hard to run with our spinnaker without destroying it. So, instead of sailing directly downwind, we had to jibe down the Bay, which is faster but not as direct. We were reaching speeds in excess of 9-10 knots. As nightfall came, we were behind Imagine and Adventurer, and crossing jibes with the newly built Schooner Virginia. The other schooners still in sight were Liberty Clipper and Heron. 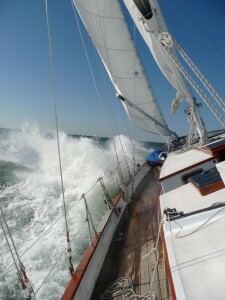 As the evening wore on, the waves and wind were building, especially as we sailed further down the bay in record time. By 9:00-10:00pm, the waves built to around six feet behind us. Our crew called out the big waves as they towered above the helmsman’s head. Surfing down the waves, our speed was increasing near 13 and 14 knots. As Captain Jen Brest was at the wheel, she called out speeds from the knot-meter 14.2, 14.9, 15.4, 16.1, 16.7 (19 mph), her voice getting louder and higher. The navigator, Rai Muhlbauer, down below then yelled back- “you hit the record on the GPS, 16.5 knots”! 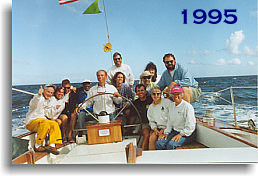 Our speed record before that was a mere 15 knots, during the schooner race of 2002. As we were surfing down these waves the wind lifted us a bit more to the finish line. We saw the running lights of four schooners behind us during the last three to four hours of the race, so we knew we were doing well. About 50 minutes before we reached the finish line, “Imagine” finished, setting a record for the fastest time down the Bay. At 3:27 am, we finished next at the Thimble Shoal finish line 127 nautical miles down the Bay from the start. We had sailed the race in a total of just 13 hours and 47 minutes, a Woodwind record for the elapsed time. (Average elapsed time for us in this race is around 22-24 hours). About 20-40 minutes after our finish, we heard the finish calls for the Virginia, Liberty Clipper, Heron (MD), and Adventurer 56. Many schooners damaged a spar (boom or mast) or sails, and some had rigging issues. The only damage that we had were two broken plates, as a wave lurched the boat and jostled them off the drying rack and onto the floor-we thought “Corelle” was unbreakable! After correcting the time for the handicap system (including our 1st place penalty), we finished fourth in class, and fourth overall. A terrific and safe effort by all of our crew! Aboard: Cptn. Ken & Ellen Kaye, Cptn. Jen & Dan Brest, Kevin Lampo, Cptn. Jon Krisman, Jocelyn Craig, Rai Muhlbauer, Kimberly Kelley, Paul Dills, Ed Rodier, and Adam Lamb. Woodwind wins 1st Over the Finish, 1st in Class A and 1st Overall on Corrected Time, two years in a row! Woodwind left Annapolis for the Parade of Sail in Baltimore on Wednesday. The Parade had been canceled due to bad weather for the past three years, but as we left our dock, there was every indication that this year’s parade will finally occur. It was quite a sight to see 35 schooners parading under sail (and engine) in the inner harbor. Friendly cannon fire is typical and this year was no exception. After the Parade, the skippers and crew all socialize at a “all hands” party in Fells Point. It’s always a special time to see old friends from previous races. Thursday morning, Oct. 14th, we departed Baltimore for our 4 hour trip to the starting area just south of the Bay Bridge, near Annapolis. As the time grew near to our starting time of 1:40pm, we were concerned that the wind was very light and would be a slow downwind run from the starting line. There was a strong current in our favor, so all the schooners had to time their start very carefully for fear of crossing the starting line too early. As the starting horn sounded, we were a few yards from the starting line, but a few boats had crossed too soon. After our start, we quickly raised our spinnaker (yes, a borrowed spinnaker to help us with any downwind conditions) and felt Woodwind come alive as the “chute” helped increase our boat speed considerably. We were able to pull out in front of the fleet with two other schooners flying chutes not far away. By nightfall, the wind clocked around to being right on our “nose”, but still very light in strength. So, the chute came down as we made a quick correction to the new wind direction. Thankfully, the current was still helping to push us down the Bay. The light wind conditions lasted through the night, and we experienced boat speeds ranging from .10 knots to 3.7 knots. We all thought that this would become a very long race. But, the weather forecast was absolutely accurate for a change and as daylight dawned, the wind picked up in speed, but it was still on our nose. Gradually we had to reduce sail area as the wind built to over 30 knots. 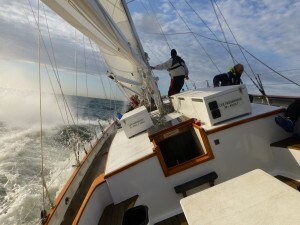 Abeam of the Potomac, we had steep, short seas as we had to pound through the waves. Not a very comfortable trip at this time. Four people onboard were feeling not well, or a bit green. We were heeled over quite a bit, mattresses went sliding along with duffels, shoes and more. After the Potomac, the current turned against us which made progress south very much in question, and we point up well for a schooner. This would not be good news for the gaff riggers in the fleet. We kept tacking from West to East and kept seeing the same latitude on our GPS.Finally, we decided to “foot off” some more (a few more degrees away from the wind) and found that the seas were not slamming us as much and our progress was measurable. At this point, there were no schooners in sight anywhere. We had a good idea where they were during the night based on radio contacts with passing commercial ship traffic. We were pretty sure that no one was in front of us. However, the slow progress coupled with discomfort made everyone onboard a bit impatient to finally cross the finish line at Thimble Shoals. We finally finished at 7:40:11 pm on Friday, almost exactly 30 hours after our start. 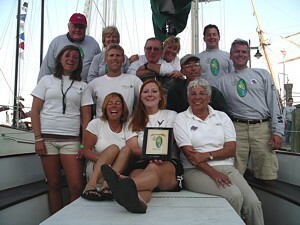 We radioed in our finish time to the race committee and learned we were the first schooner to finish! As we were motoring into Portsmouth to our berth for the next few days, we also learned that most of the schooners had dropped out of the race, opting to take shelter in Solomons and Reedville. It was unfortunate that the docks at Portsmouth had only a few schooners there for the weekend activities. The oyster and pig roast party on Saturday afternoon was most enjoyable as always. At the awards ceremony, we learned we won three awards: 1st over the finish, 1st in class (A), and 1st overall on corrected time. We received another beautiful handmade mantel clock by Robert Latimer, which makes our collection number five. Woodwind was also engraved on the perpetual trophy for the second year in a row. We have the distinction of being the only schooner to have won the perpetual trophy three times. The closest finisher to us on actual time was our friend Aram, on Heron, who finished about 2½ hours after us. Next was Imagine, a minute later, followed by Grand Nellie a half hour after Imagine and then Pride of Baltimore II finished 4 hours after us. 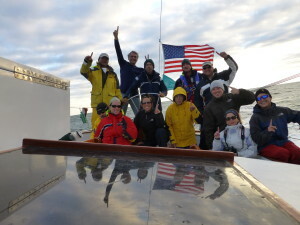 We had a terrific group of guest crew aboard, who were committed to doing what they can to help us through the grueling race down the Bay, even though the trip was not as comfortable as we all had hoped. We thank all of them, plus our regular crew, and our longtime friend/navigator supremo, Rai Muhlbauer, who spends so much time down below trying to figure out our best navigation strategy in a pitching boat heeling 25 degrees while slamming “to weather”. Woodwind wins 1st Over the Finish, 1st in Class A and 1st Overall on Corrected Time! 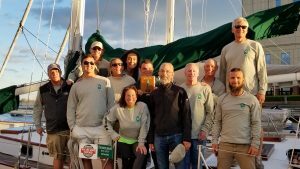 When our crew of twelve showed up at the dock in Annapolis, ready to depart for the trip to Baltimore to begin the festivities prior to the start of the Race, it was like deja vu of previous years. A strong Northwesterly wind was blowing with gusts beyond 30 knots. The forecast was for the winds to remain strong until nightfall. 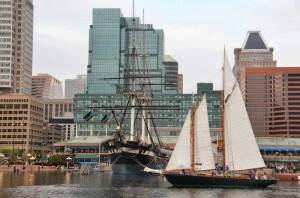 We knew that the “Parade of Sail” in the Inner Harbor would be canceled again. Should we leave Woodwind at the dock and drive our cars up for the parties? The votes came in and we decided to drive up by car. It ended up being a wise choice as we would have been too exhausted to really enjoy the festivities, which were a high priority with us! Baltimore does a fantastic job of hosting the parties for all the crew of the 36 schooners. Our liaison, Carolyn, brought us 2 tubs of her homemade brownies and a special care package of snacks and goodies for when we are on “watch”. Carolyn has been our Baltimore liaison for more than 6 years. We all met at Woodwind on Thursday morning to prepare for the 1:30pm start. The wind had turned around to the Southwest, blowing between 12 and 22 knots. This was perfect weather for us to do the race as we do very well beating into the wind compared to the gaff-rigged schooners. After a picture-perfect start, we took off in the perfect wind to sail our own race. As we tacked down the Bay, the rest of the fleet was well behind us, and by nightfall, we could not see another schooner. 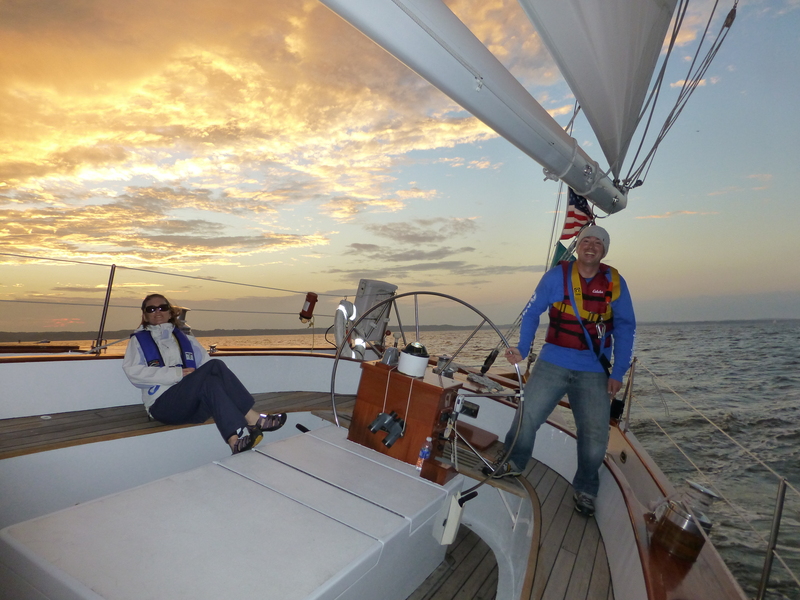 Once we cleared the Choptank, the wind cooperated to allow us to steer 180 degrees, close hauled on a starboard tack all the way down the bay to just before the finish line, where we had to put in a short tack to finish over the Chesapeake Bay Bridge Tunnel. 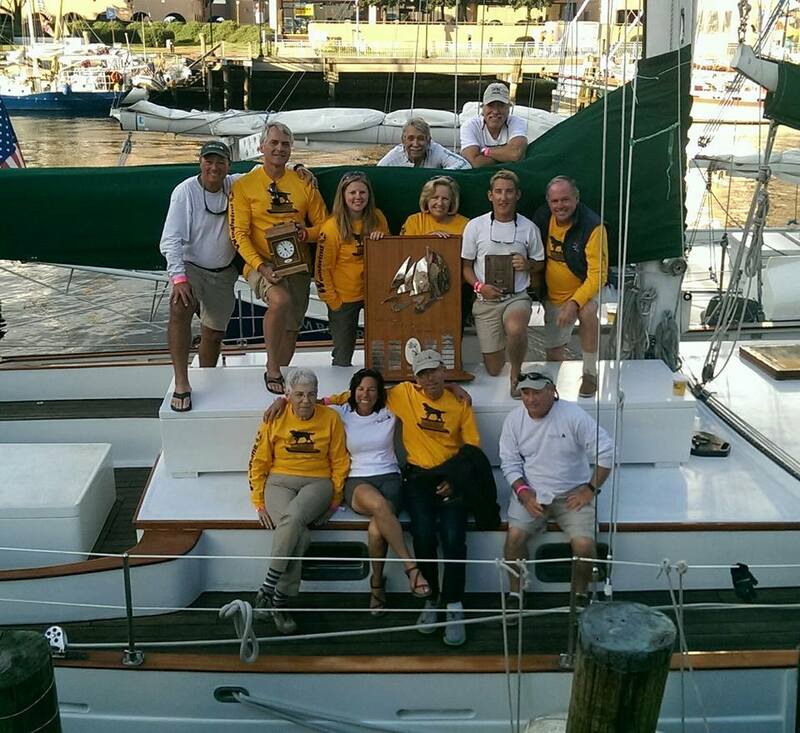 It was 9:19:37 am and when we contacted the race committee to report our finish, they confirmed what we already knew, that we were the first boat to finish the 14th Great Chesapeake Bay Schooner Race. At this point, we were able to see the Pride of Baltimore II in the distance behind us. She finished at 11:00 am. It was lonely at the docks in Portsmouth waiting for the rest of the fleet to arrive. We celebrated our arrival with a champagne toast and a great big breakfast which Capt. Jen prepared. The other schooners started to arrive after dark on Friday and into the morning on Saturday, nearly a full day later than our finish. The hospitality at Portsmouth was fantastic, plus it is a beautiful spot for all the schooners to dock together. There were two more days of parties including the awards ceremony. 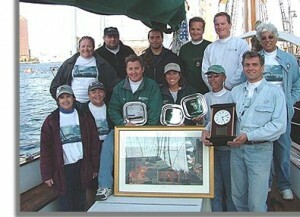 We received a beautiful handmade clock for the first schooner to finish, a framed, signed print by John Barber for first on corrected time plus three silver tray trophies. Pride got first in her class (AA) and a trophy for the schooner which had the largest margin of finish time to the next finisher in her class. Captain Jan Miles should be proud of how well he sailed her, having to tack her down the Bay. Our guest crew were lots of fun to have onboard: Frequent Sailor Susan, Frequent Sailor Paul, Gerry and Yvonne. Rai Muhlbauer returned as “navigator supremo” for his 10th time and regular crew Matt, Mark and Chris offered their expertise in addition to family members Ellen, Captain Ken, Captain Jen and Dan. 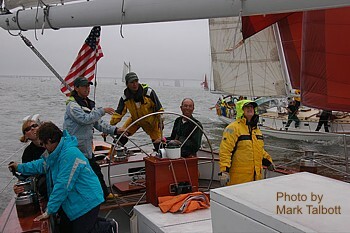 The day we left Annapolis for the Thirteenth Annual Great Chesapeake Bay Schooner Race’s opening ceremonies in Baltimore was one of the breeziest, wettest, coldest days of the entire 2002 sailing season. The frigid nor’east breeze was right on our nose all the way up the Bay into Baltimore Harbor. It was blowing a steady 30 knots with gusts to over 40. Once we arrived in Fells Point and docked, the Race Committee had decided to cancel the Parade of Sail through the Inner Harbor due to the rain and high winds. Since we had just spent 4 hours motoring in that wind, we weren’t disappointed to have to stay put in our slip. Of course, we were all curious what the weather was going to be like for the race start the next day, Thursday. As it turned out, as soon as we arrived, the rain stopped, the wind lightened and the sun even came out. The hospitality and pre-race parties in Fells Point were absolutely fabulous. Our wonderful repeat liaison, Carolyn Mollenkopf, greeted us at the dock when we arrived with a big canvas bag of goodies she assembled for our crew to munch on during their watch. She also brought her famous, and our favorite, double fudge brownies with chocolate chips. Then she took the crew’s wet clothes home to dry them out. Now, that’s hospitality! Thursday morning the wind was light, but we had sunshine. The forecast was for light northwest winds, 5-10 knots. Not really enough to make a quick race! When we arrived by motoring to the start line south of the Bay Bridge for our 1:30pm start, the winds went super light to less than 5 knots. The starting gun went off as planned and all of the 37 schooners just started drifting with the current. Since we would soon be fighting a current against us, we had no choice but to anchor just after crossing the starting line, an hour later. At around 4:30pm the wind filled in a tad from the NW and up went the anchors. We barely moved at between 1 and 2 knots. So, we hoisted a borrowed J120 asymmetrical spinnaker on our foremast in place of our jib and fisherman. The sail filled nicely and we kept it up and flying through the waning daylight. Having some really experienced guest crew onboard that frequently race with spinnakers helped us immensely with the huge sail. Once the sun set, the wind picked up nicely and Woodwind moved along at a 10 knot plus boat speed. Then shortly after 11:00pm, the wind became a bit too strong to fly the spinnaker. We had already taken a healthy lead on the entire fleet. So, down came the big spinnaker and up went the jib and fisherman while surfing down some pretty big waves. Our boat speeds were the highest we had ever experienced! A whopping 11 to 13 knots sustained with bursts to 14 and 15 knots. We were planing! After speeding by the famous Potomac toilet bowl, we had to put in a jibe just before Windmill Point. Right after we did a noisy, controlled (somewhat uncontrolled?) jibe, we heard a bang! Our main halyard had parted and our mainsail crept down the mast. We spent 23 miserably frustrated miles sailing without our mainsail and for at least half of it we had out fisherman down as well so we could hoist a crewmember up the mast with that halyard to make the repair. The chosen crew was Capt. Jen’s husband, Dan. He said “this isn’t the most comfortable place to be at this time!” Since we were still making decent speed with large waves tossing our stern around, Dan had to tightly wrap his legs around the top of the mast 65′ above the water. The job of reeving a new halyard line took longer than usual because of the strong winds. The winds were 35-40 knots instead of 5-10. A slight understatement in prediction making. Our boat speed during this 23 mile period had been reduced by about 3 knots per hour. At this time, a few boats had caught up to us and began to scream by us: America, Imagine…!, and Pride of Baltimore II. Once we were able to set the main and fisherman, our boat speed was back up to pre-breakdown speeds. Since we had sped down the bay after raising anchor, we finished early Friday morning at 6:52am. America crossed the finish line at Thimble Shoals, Norfolk, an hour before us. Imagine…! crossed 30 minutes in front of us and Pride crossed 5 minutes ahead. We corrected out to 2nd in class and 2nd overall based on handicap. We have a 5% penalty from placing well last year. One of our favorite competitors, Adventurer, had broken his steering system about an hour after we passed him in the toilet bowl area. He did not finish the race. Another boat in our class, Raindancer, had to drop out when a crewmember got whacked in the head by the boom and had to be rushed by helicopter to a shock trauma facility at about the same time that Adventurer lost their steering. The activities in Norfolk were special once again. The Norfolk parties were fantastic, including our own annual “Woodwind Breeze” rum punch party for all race participants and volunteers. 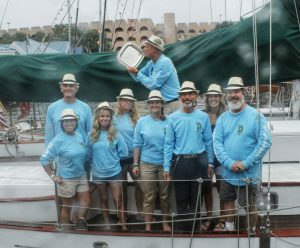 Hats off to the greatest guest crew for their congeniality and knowledge of sailing with a spinnaker: Dr. Larry Hennessy, Dr. Debbie Whitehead, Rai and Trudi Muhlbauer. 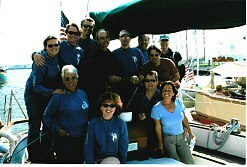 Also Joni Brooks and Dr. Richard Brinker were eager learners and lots of fun to have aboard and at the parties. 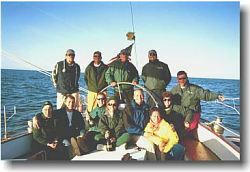 The day we left Annapolis for the Twelfth Annual Great Chesapeake Bay Schooner Race’s opening ceremonies in Baltimore was one of the breeziest days of the entire 2001 sailing season. The frigid northwest breeze was right on our nose as we entered the Patapsco River heading into Baltimore Harbor. It was blowing a steady 30 knots with gusts to over 40. 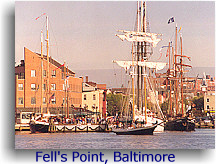 Once we arrived in Fells Point and docked, the Race Committee had decided to cancel the Parade of Sail through the Inner Harbor due to the high winds. Since we had just spent 4 hours sailing and motoring in that wind, we weren’t disappointed to have to stay put in our slip. Of course, we were all curious what the weather was going to be like for the race start the next day, Thursday. The hospitality and pre-race parties in Fells Point were absolutely fabulous. Our wonderful repeat liaison, Carolyn Mollenkopf, greeted us at the dock when we arrived with a big canvas bag of goodies she assembled for our crew to munch on during their watch. She also brought her famous, and our favorite, double fudge brownies with chocolate chips. Thursday began with much lighter winds and somewhat warmer temperatures as the captains and crews readied their vessels for the trip down the Bay to the Bay Bridge for the 1:30pm start. By the time the race was ready to get started, the wind became more westerly and was really light in strength, only about 10-15 knots. 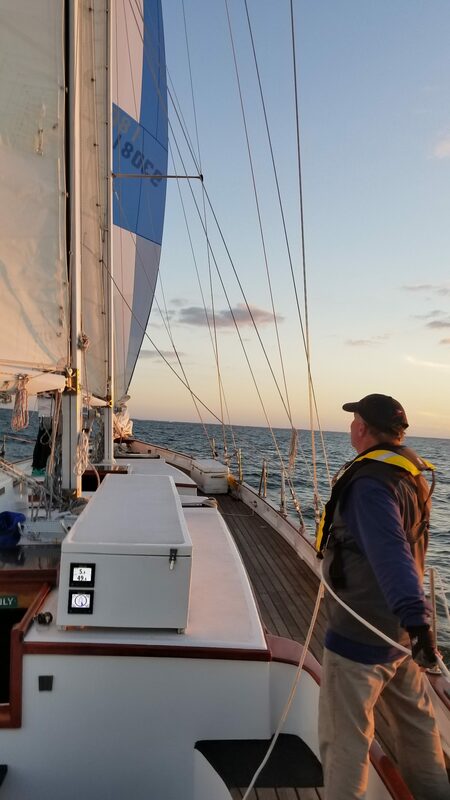 Our navigator, Rai Muhlbauer (his 8th time at that job), forecasted the winds to veer around becoming more southerly as the sun started to set (a few hours after the starting gun). Our strategy was to start to windward of our class with good forward momentum (speed!) and stay on the western side to take advantage of the dying breeze which would be more predictable (and stronger) than venturing over to the eastern shore. We quickly took an early lead at the starting gun, being first over the line and the leader down the bay throughout the waning daylight hours. Once night fell upon us, we went into our planned watch system with 4 crew on duty (out of the 12 onboard) for 4 hours shifts. Captains Ken and Jen and navigator Rai were the watch captains. The 4 guest crew were David and Diana Toomey-Wilson and Felix and Natalie Fisher. They were our most enthusiastic guest crew ever! 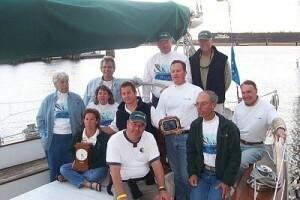 Other crew onboard were Admiral Ellen, Sean Ellis, Jim Washburn, Ed Reilly and Dan Brest (Captain Jen’s hubby). The night sky was absolutely spectacular. Throughout the night, flashlights were focused on the sail trim yarns (telltales) as the southerly winds required us to sail as close to the wind as possible in order to tack our way down the Bay. Every six hours, a new tidal current had to be factored in as we had the current in our favor and then six hours later it would be against us. Rai had to figure where he wanted us to be with these currents. Careful sail trim to maximize our speed was essential. Almost all of the photos from the race show our crew always looking up at the sails! When we weren’t checking on the sails, we were looking for the other schooner’s running lights and trying to figure out which boat was where. We also have to keep track of the commercial traffic of tugs, freighters and container ships. When dawn came, we could see a few vessels in the fleet way behind us. We still had one third of the bay to cover before reaching the finish line at Thimble Shoals off of Norfolk. One thing we realized, the schooners we thought were around us were not, instead we had different schooners than previous years slightly behind us. Through the night we thought we had done really well, but with the recognition of these other boats, we were confused. Most of this time was spent bucking the unfavorable tide trying to make progress down the Bay in very light winds. Wolf Trap lighthouse remained unreachable for many, many hours. We all got impatient with the same view! Once at the lighthouse, we had to decide whether to chance going inside to catch a more favorable current or to remain outside and go slower. Going inside required us to be sure we could follow a narrow channel of deeper water. We took the chance on the inside passage, and right then the wind shifted slightly so we didn’t even have to put in a planned tack. Whew! We finally finished with a favorable current late in the day on Friday (around 5:00 pm). The wind had picked up a bit by then and we didn’t have to agonize over seeing the Thimble Shoal lighthouse for very long. After finishing, we called in to the Race Committee and they confirmed what we thought: we were the first schooner to finish the Great Chesapeake Bay Schooner Race. A champagne celebration followed the radio call. We want to thank our excellent guests for all their help, Felix and Natalie Fischer of Washington D.C. and Diana and David Toomey-Wilson of Connecticut. The fleet behind us at the start of the race. Our class started at 1:40 pm just south of the Bay Bridge with 15 to 20 knot breezes out of the Northwest. The forecast was for the winds to moderate and become light and variable during the night. This was one of those rare times the weather forecasters were right! The nice breeze at the start made for an exciting start and subsequent trip down the bay before nightfall. We were the first schooner across the line at the start. This enabled us to get clear air and set our own course down the bay. By sunset we were off the Patuxent River as the winds began to die down considerably. We were the first boat in front of the rest of the fleet. As the winds lightened from a beam reach at 15-20 knots to a broad reach at 10 knots or less, that’s when things began to heat up. There were 6 boats that flew spinnakers and four of them passed us after sunset. What could we do? We tried to do a “wind dance”; we tried whistling (guest crew Paul Dills of Kentucky told us it worked for him when he sailed every time!). We wished we had a spinnaker (a large nylon ballooning sail to catch the wind when running downwind). The only answer to our prayers came when the wind shifted more forward of the beam and those spinnaker boats just ahead could not fly those “chutes”. Gradually, we passed each one out, except for one, which became the first to finish and first in class (Adventurer, a Cherubini 56′). She was just ahead enough to jybe over before the wind shift and catch more downwind breezes the rest of the way to Norfolk! She flew her big running spinnaker all night and the following morning while the boats behind us had to tack their way down the way. Yes, the wind was light and “variable”. At least we were able to sail on a close reach to the finish and not have to feel penalized for not having a spinnaker with us when the wind shifted over. And, we never had to put in a tack. The night brought light winds, frustratingly light. We had to tweak the sails all through the night using flashlights. At one point the knotmeter read “0.00” and slowly went up to between 2 and 5 knots. Fortunately, we had the current “with us” and we weren’t going backwards over the bottom. We finally finished at 1:24 pm on Friday, some 2 plus hours after “Adventurer”. Looking at the Finish line off of Norfolk, VAIt was painful to see the Thimble Shoals Light (the finish line) for so long before we crossed. It took hours to cross once the light was in view, screaming along at 2.2 knots. In less than an hour, the current would turn against us and make the short distance seem even longer in these light airs. And, the rest of the fleet behind us had to deal with a windward beat to the finish line with tacking and sailing against a foul current. The rest of the boats in our class finished more than 5 hours after us, having to struggle with these frustrating conditions. Our favorite competitor, Imagine…!, finished nearly seven hours behind us! We are indebted to our faithful crew for all their work tweaking the sails and navigating us through the current and flukey winds to a finish we can be proud of. Captain Jen was outstanding as captain and cook. We certainly ate well during the race. Our guest crew were eager learners and most congenial. Thanks to our “guest” crew members: Joel Brest from Connecticut, Vicki Waidner from Maryland, Paul Dills from Kentucky and Dem Answine from Pennsylvania. Our class started at 1:40 pm just south of the Bay Bridge with 30 knot winds pushing us down the Bay. We were all lucky to have a downwind start. If we had 30 knots of wind “in our face” it would been a long, wet, bumpy ride requiring full foul weather gear and sea boots, very few sails flying, endless crashing through the waves and possibly broken gear for all of us. But… it wasn’t anything like that. Because we were sailing downwind, the speed of our vessel was subtracted from the wind speed and it was a fast and comfortable sail down the bay in 18-20 knot breezes. Right after the starting gun, we shook out the double reef in our main and hoisted the fisherman, so all our sails were up. We scooted off to an early lead on the fleet for quite some time. Boat speed was around 10 knots and sometimes faster. 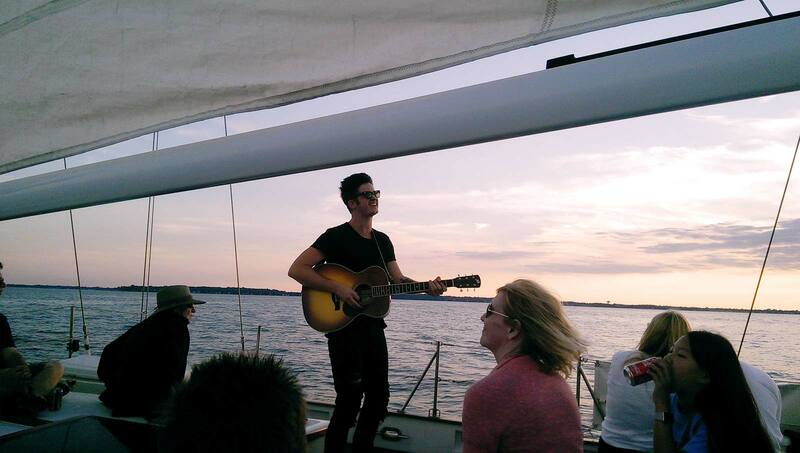 This was awesome, comfortable sailing! Just before sunset,terrific crew “Imagine…!”, another schooner built by Scarano Boatbuilders, same builder of Woodwind and Woodwind II, decided to try to pass us to windward because Highlander Sea, a 154-foot, Nova Scotia Grand Banks Schooner was aiming to pass them to windward. So, Imagine needed to protect the wind in her sails and started to edge closer abeam to us. She couldn’t pass underneath us (our sails would blanket her wind), so she tried to steal the wind from our sails, to slow us down and pass us. But we wouldn’t let her do that! Captain Jen was at the helm and she kept altering course towards the west to prevent “Imagine…!” from getting to the weather side of us. The racing rules and tactics allow and encourage this. This went on for over an hour, sailing side by side at times as close as 50-feet away. “Please pass the Grey Poupon” was shouted in good fun. Captain Jen broke the stalemate by initiating a fake gybe and “Imagine…!” went over on a 120 degree more easterly course. Darkness had set upon the fleet, it became very difficult to see all the running lights and to decipher where our competition was in the sea of black. In fact, the sky was so filled with stars, our crewmember, Rai Muhlbauer thought it felt like we were sailing in a planetarium. Once we lost track of their running lights, we didn’t see Imagine…! again until after they finished the race 20 plus minutes behind us. The one light we saw was (unfortunately) a stern light from the winning schooner ahead of us. A 56-foot, Cherubini design named “Adventurer” finished just 14 minutes ahead of us as the first schooner to cross the line. We finished second and “Highlander Sea” finished 4 minutes behind us. We attempted to fly a reaching asymmetrical spinnaker that we borrowed from a J-120, but it didn’t seem to be worth the work as it was too dark to be able to tend to it effectively. Of course, since we never fly one, the entire arrangement for it was jury rigged and gybing it became an all hands on deck request (we had 12 crew onboard). Adventurer flew a running spinnaker throughout the race and since the rum line was directly downwind most of the time, she had a distinct advantage being able to use it. We were able to sleep comfortably and Jen made us a great Italian dinner. We arrived at the finish line at 5:27am Friday morning, which meant the race was less than 16 hours long for us. Since the length was 127 miles, we averaged 8 knots. It is especially impressive when you take into consideration that the winds lightened considerably at sunset and did a major 90 degree shift in direction a little bit later. Our celebration breakfast was cooked and served upon our arrival at the Norfolk docks at around 8:30 am. We had all of Friday to rest up. The planned activities in Norfolk on Saturday got under way at 1:00 pm with the Pig and Oyster Roast and pizza party right nearby the 42 participating. 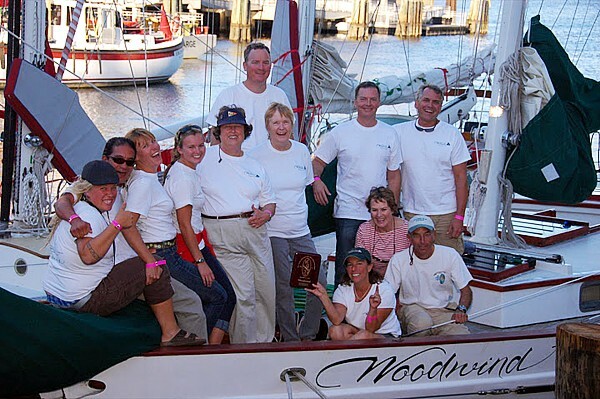 The awards were presented at 4:00, followed by our annual Woodwind Breeze party where every participant and volunteer was invited aboard Woodwind for our signature rum punch. We’ve never had so many people onboard. Them Eastport Oyster Boys performed, too. The resident meteorologist broke up our party at 9:30pm for the next sponsored party ashore. He talked to us about the impending hurricane, “Irene”. More beer was served. Upon awakening on Sunday morning for the official farewell breakfast, a lot of aspirin was dispensed on most boats. It was a great five days. We corrected out to 3rd place in the race. Our guest crew did a fine job. Two of the four were repeat guests and have become invaluable sailors. The others were quick learners and all aboard were a congenial mix. Thanks to our “guest” crew members: Dr. Larry Newton, Jeff Beauvier, Susan Helbert and Greg Bressler. 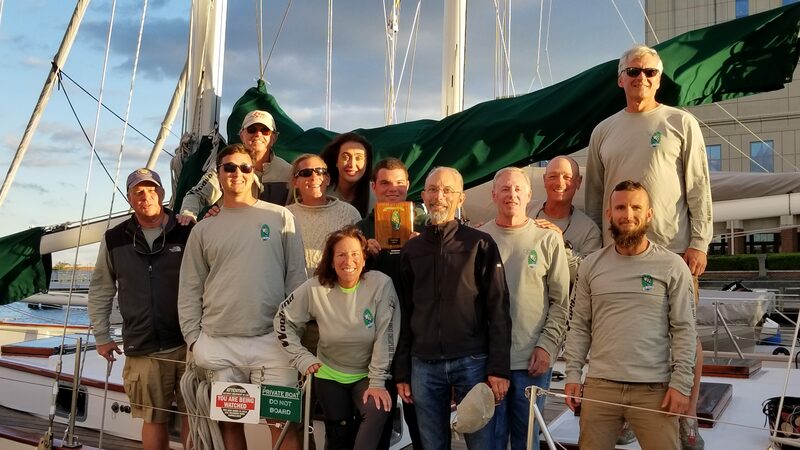 Schooner Woodwind finished first in class and first over the finish line in the 9th Annual, 128-mile, Great Chesapeake Bay Schooner Race from one mile south of the Chesapeake Bay Bridge (near Annapolis) to Thimble Shoal off of Norfolk, Virginia in mid-October. We, aboard Woodwind, crossed the starting line to the windward side just astern of the 88-foot, Ocean Star for clear air in a downwind race down the bay against a foul current. Woodwind headed toward the western shore in hopes of catching a bit more breeze from the northwest as she passed the Severn River, South River and Rhodes Rivers while sailing in shallow waters to diminish the effects of a flood tide (which flows up the bay). This strategy paid off as the boat quickly accelerated to a large lead on the rest of the fleet. Later in the evening the tide was expected to turn in our favor, so we took the route towards the deep part of the bay. The winds went fluky and light, out of the northeast. Our boat speed ranged from 4 to 7 knots in this breeze. This made it easy for a great dinner and good level sleeping accommodations for the crew. 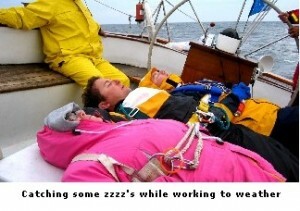 We had a watch system of 4 crew members on watch for 4 hours and off for 8 hours. Pretty easy with such calm conditions. However, on watch we had to constantly monitor the trim of our sails with flashlights all through the night because the wind was off our quarter (almost dead behind us) and all sails needed to be filled. Considerable shipping traffic also needed constant attention because we were close to the shipping lanes. We tried to keep track of the running lights of our competitors near us: “America”, “Imagine…!”, and “Farewell”. As dawn broke, we held a narrow lead over “America” and “Imagine”. However, our new task was to decide what to do when we reached “Wolf Trap” , a lighthouse marking shoal water away from land, and how to approach Thimble Shoals for the finish line. We had to consider the tide which was against us and the fluky, calm north-east wind. We went inside the light at Wolf Trap into shallower water. This helped the effects of the foul current! Other boats remained much more to the east and out in deeper water. Sailing this route also would provide us with the shortest distance to the finish line, which was about 12 miles away. We crossed the line at 10:46 am Friday. “America”, 139-foot Scarano built schooner, finished after us, next was the 76-foot “Imagine” and then the 47-foot “Farewell”. These are all gaff rigged schooners! As usual, the parties were absolutely great in Norfolk. We hosted our own “Woodwind Breeze” party to celebrate our win after the awards. This race was by far the most pleasant in terms of conditions during the race and the warm and balmy 70+ degree weather we had throughout the weekend. It was also the race with the least damage to masts, sails, and crew AND with enough wind for most boats to finish. We were very pleased with our win. Our closest competitors were larger boats, and their rigs are designed for downwind sailing, whereas Woodwind’s staysail rig excels in going upwind and tacking. This forced us to sail smart as well as fast. We want to thank our excellent guest crew members for all their help, Joe and Joan Warren of New Jersey, Barbara Halge of Maryland, and Ed Bednarz of Maryland. We deeply thank the organizers that work so hard to make this event the highlight of our seaon. We wouldn’t miss this event for anything! 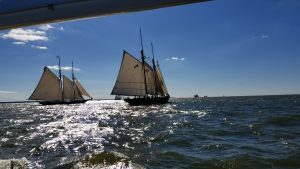 Twenty-five schooners started the eighth annual Great Chesapeake Bay Schooner Race on Thursday, October 16 at 1400, in breezy downwind conditions that could push the schooners quickly down the bay to Norfolk, Virginia. The race is 127 miles long that can last between 14 hours and 36 hours, or even longer. The race was exciting this year because we were in constant sight of at least two other schooners during the entire race. The two schooners were the magnificent, 171-foot, gaff topsail schooner Pride of Baltimore II and the 76-foot, gaff-rigged schooner Imagine, which was built in the same yard as Woodwind. The lead of the race changed at least five or six times during the night. We hit our top speed ever (12.9 knots). Woodwind finished the race around 5:00 am. Fifteen minutes earlier, Imagine finished the race and the Pride finished minutes in front of Imagine to cross first across the finish line. The Pride of Baltimore II and Imagine are excellent downwind sailing boats, while in comparison Woodwind excels in upwind conditions. Woodwind finished second in her class. The race was uneventful compared to previous years, as there was no storm near the finish and there was no hard tacking down the bay. All the schooners finished early this year, which left much more time to party in Norfolk. Thanks to our “guest” crew members: Dr. Larry Newton, California, Bud Tayman, Maryland and Paul Dills, Kentucky. 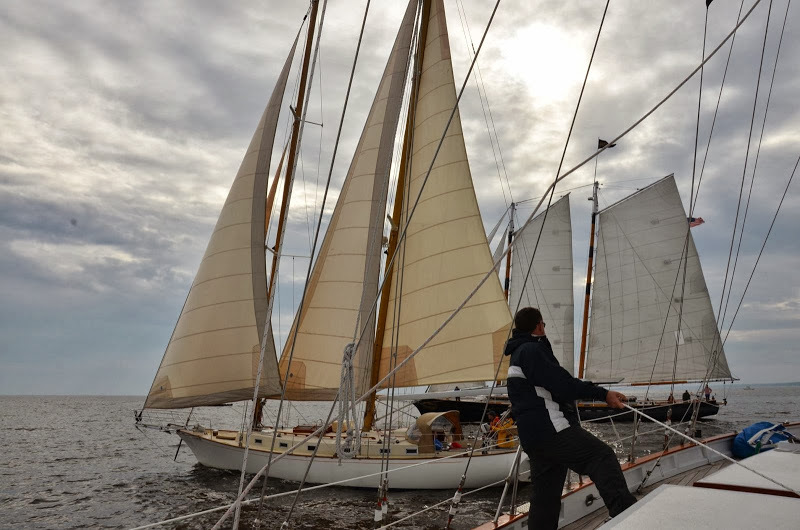 Twenty-eight schooners started the seventh annual Great Chesapeake Bay Schooner Race on Thursday, October 17 at 1500, in relatively calm wind just south of the Bay Bridge to race 127 miles down the Bay to Norfolk. The start of the race is always magnificent, not normally for tactics, but to see the number of schooners all under full sail reaching for the starting line. 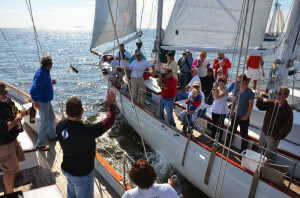 This year, tactics and knowledge of rules were used when 112-foot Seljm tried to cross the starting line to windward of Annapolis’ own 74-foot Woodwind. Woodwind having rights on Seljm forced the bigger schooner into a slow 360 degree turn away from hitting the committee boat and restarting around seven minutes later. The wind was not cooperating with these schooners. Calm winds between 2 and 6 knots blowing right up the Bay do not help push schooners toward the finish line. Add in an ebb current and some schooners were going backward through the night. Liberty Clipper, New Way, and A. J. Meerwald dropped out that night realizing even a storm could not get them to the finish line by the time limit of 1100 Saturday morning. And the wind did come. By late Friday afternoon, the wind had built to 20 knots still out of the southeast and the waves were up to three feet. Early evening, Seljm and Woodwind, the leaders in the race, crossed tacks with Woodwind slightly ahead. Shortly after 2300 Friday, a whomping thunderstorm hit the schooners with up to 65 miles an hour winds. Eskasoni, a staysail schooner from Galena, MD got knocked down with three sails shredded. Other schooners saw the storm coming and motored for cover into a bay or river. Woodwind and Seljm were near the finish line at Thimble Shoal. Seljm, from London, crossed the finish line as the storm hit. Woodwind was eleven miles when the storm forced them to go east while dodging commercial traffic in the York Spit Channel. 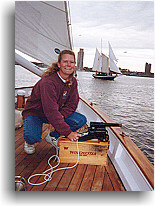 Jennifer Kaye, daughter of Woodwind owners Ken and Ellen, was captain as the storm hit. Her first “real ” storm as captain, Jennifer was at the wheel facing the rain, sleet, and waves breaking over the deck. She refuses help. “I’m going to stay at the wheel until I drive us out of the storm,” she yells to her father down below who is navigating through the traffic. After the threat of traffic was gone, Woodwind tacked to go back toward the finish line. The wind behind the schooners now, but many with only one or two sails up, were screaming toward the finish. Woodwind finished around 2 hours behind Seljm, correcting to 13 minutes behind the bigger boat, but first in class. Flutterby and Ocean Star from Portland, Maine finished respectively around six hours later. Farewell, also from Annapolis, MD finished first in her class which finished at Windmill Point. 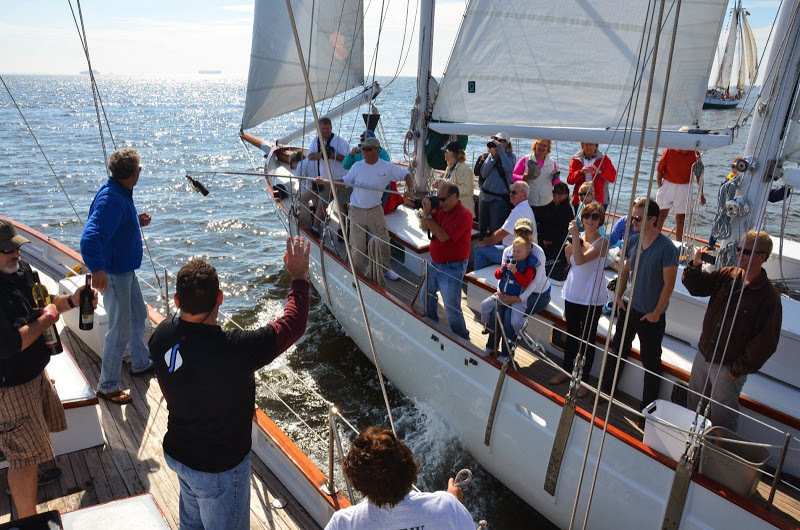 A special thank you goes out to the three guest crew members who helped us to our victory of the Great Chesapeake Bay Schooner Race. Thank you- Lisa DeGroot, Ron Weller, and Doug Bourgoine. We couldn’t have done it without you! 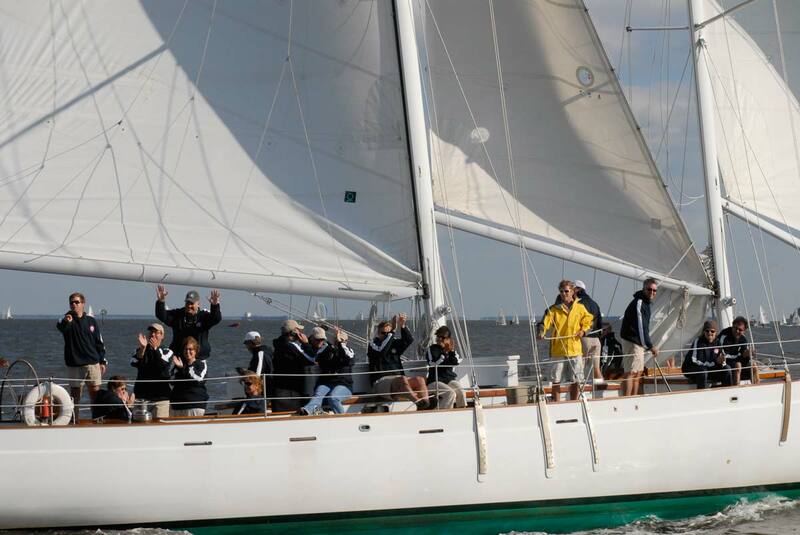 Annapolis’ own Schooner Woodwind proved herself worthy, taking line honors, first in her class, and first overall at the sixth annual Great Chesapeake Bay Schooner Race in mid October last fall. Heading a crew of 13, Woodwind owner and skipper Ken Kaye guided the 74-foot staysail schooner over the finish line at Thimble Shoal near Norfolk, Virginia, 23 hours, 3 minutes, 59 seconds after the start south of the Chesapeake Bay Bridge off Annapolis, more than 130 miles north. Woodwind crossed a minute and a half in front of the just-launched schooner America. The two fastest boats were both built at the Scarano Brothers Yard in Albany, NY. The race started in light, southeasterly winds at 3 p.m. on Thursday, October 19, with 35 entries, ranging from the 36 foot long Foon Yin, a junk rigged schooner, to the 171-foot Pride of Baltimore II, skippered by Bob Glover. Pride crossed the north/south starting line first on a broad reach, followed closely by Woodwind; but Woodwind quickly took the lead and held it through to the end. The winds picked up after sunset Thursday evening, and stayed brisk even through dense fog that covered the mid-Bay before dawn on Friday. When the fog lifted the crew of Woodwind was dismayed to see America hull-up on the northern horizon and growing larger by the minute. The southerly wind forced the majority of the fleet to beat from the Eastern Shore to the Western Shore repeatedly and with little progress. 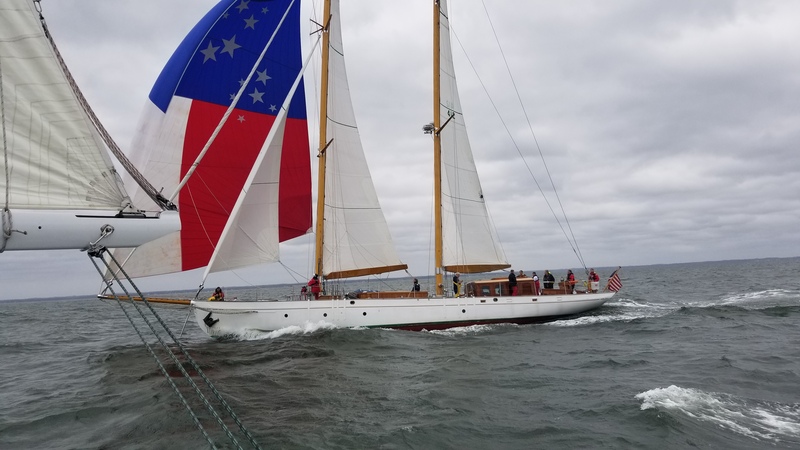 It was Woodwind’s marconi staysail rig that allowed her to point to weather better than anyone else, and to reach Norfolk before a cold front moved across the Bay Friday night and Saturday morning. The storm pitched 45-knot gusts at the fleet, blowing out four sails on Clipper City and snapping the foretop mast of Tree of Life. Conditions were so awful that more than half the boats in the fleet had dropped out of the race before reaching Cove Point near the mouth of the Patuxent River, leaving only 15 still competing; only 10 of these crossed the finish line. Once the weather cleared, the crews celebrated at a pig and oyster roast held Saturday afternoon, where prizes and trophies were doled out to the winners of the four classes. Comments from Jennifer Kaye: A special thank you goes out to the four “guest crew members”, Susan Helbert, Larry Newton, Julia Kasinkas and James Johnson, for an excellent job while on watch, tending sails, helping with the navigation, and steering Woodwind to glory!! We could not have done it without you!